Happy Birthday America!!! 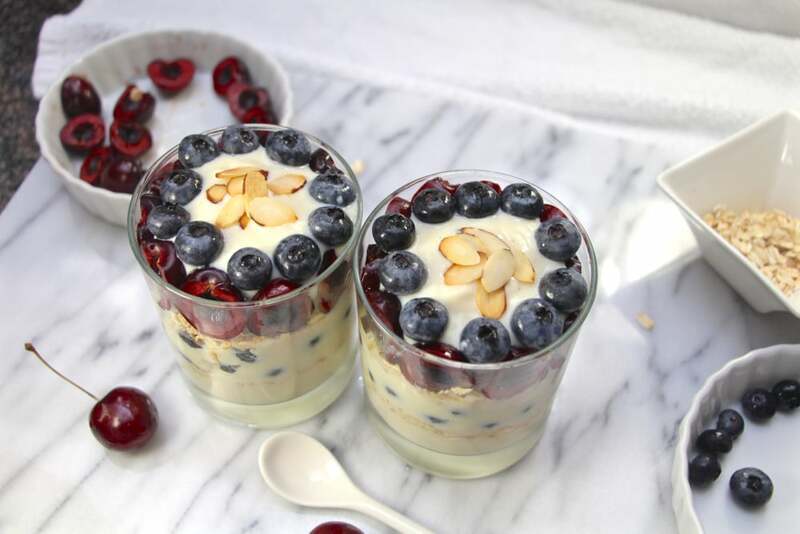 This Fourth of July, stay cool with a chilled fresh fruit and youghurt parfait! 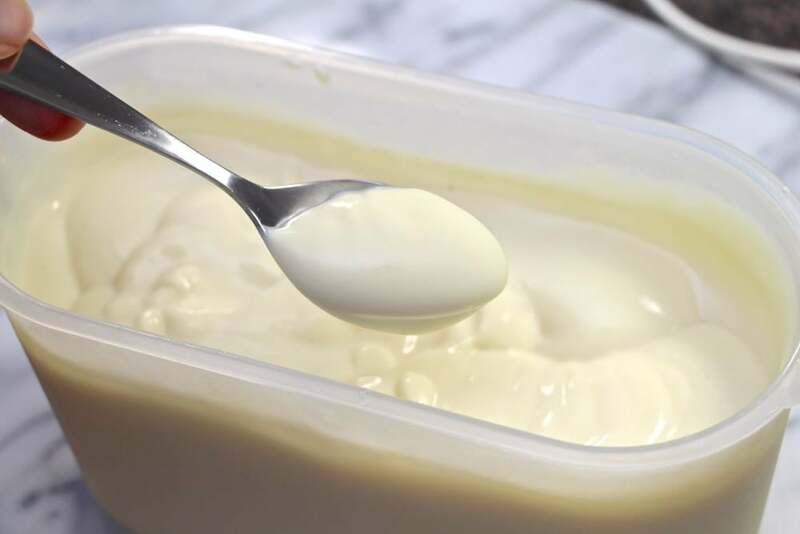 I make homemade soy youghurt, and flavour it with vanilla bean. It's fairly easy and really tasty. The rest of the ingredients are simple and wholesome: dark cherry halves, rolled oats and blueberries. When I'm in a rush, I just throw all the ingredients in a bowl and stir, but today's special, so let's get fancy! 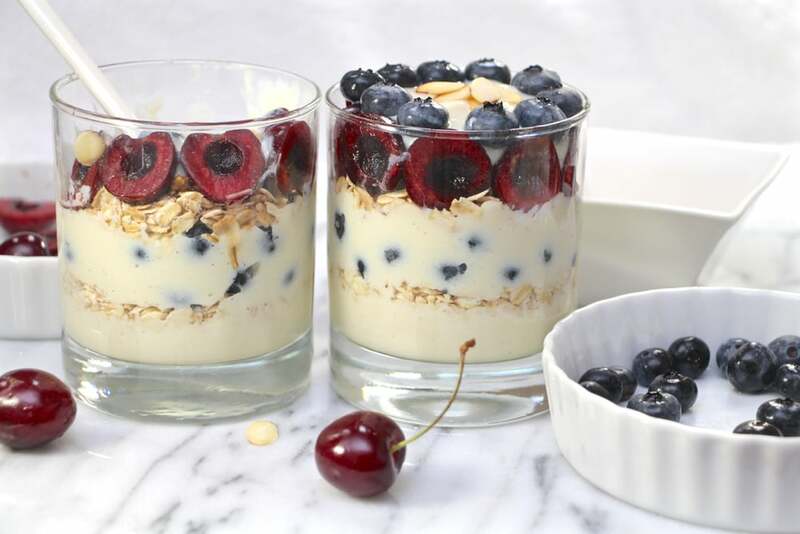 First, I like to add a layer of youghurt, then oats, then berries. 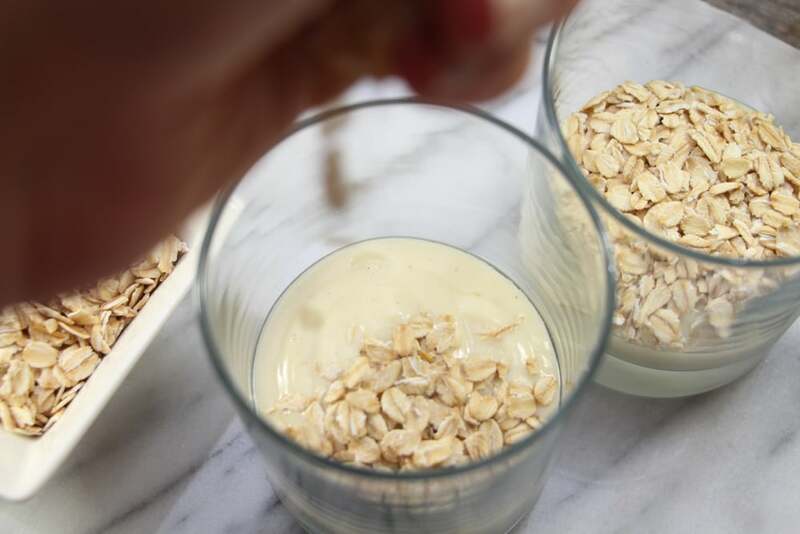 The oats help keep things in layers - they add a dryness and stability. 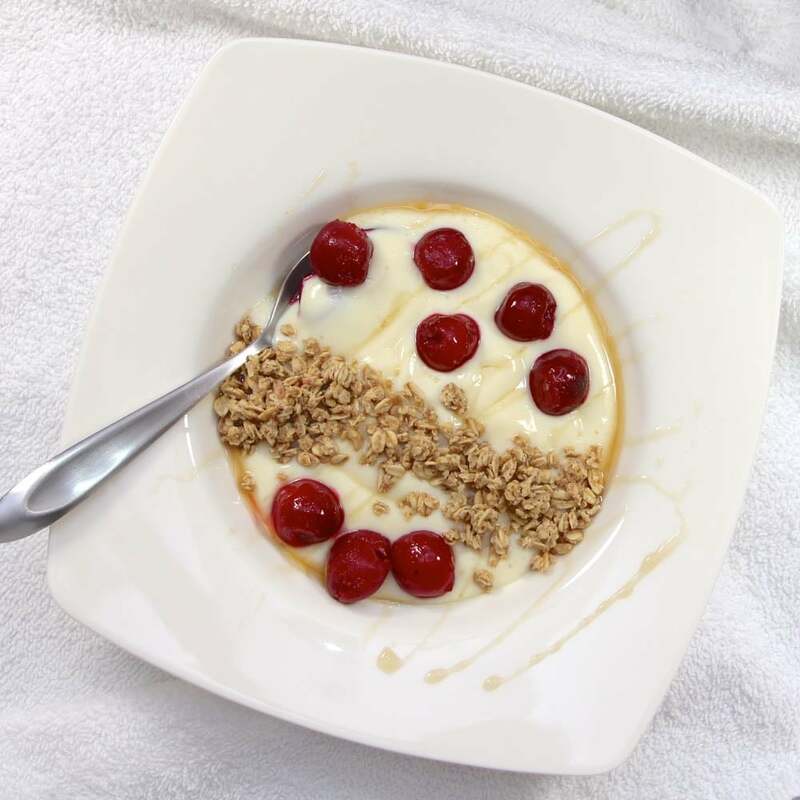 Sometimes, the sugars in the fruit draw out moisture from the youghurt, making a watery pocket in the parfait. The oats soak up the separating water and keep things texturally consistent. 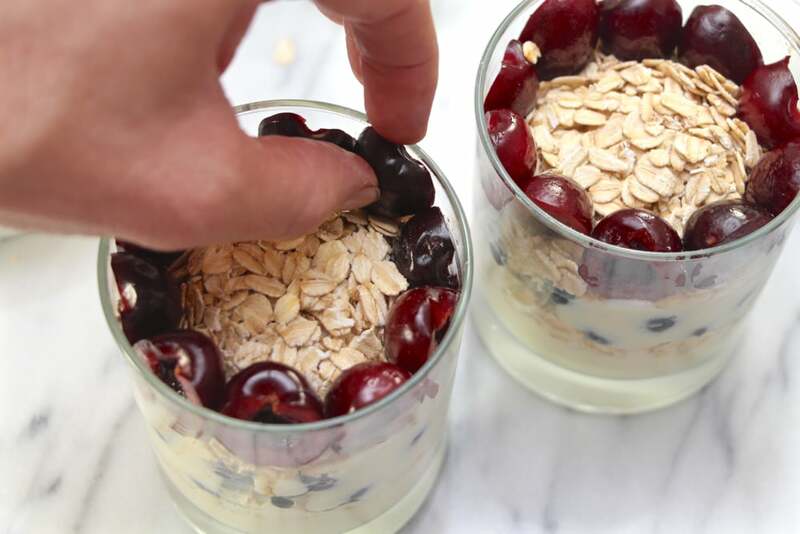 Keep layering the youghurt, oats and fruit until about an inch from the top. 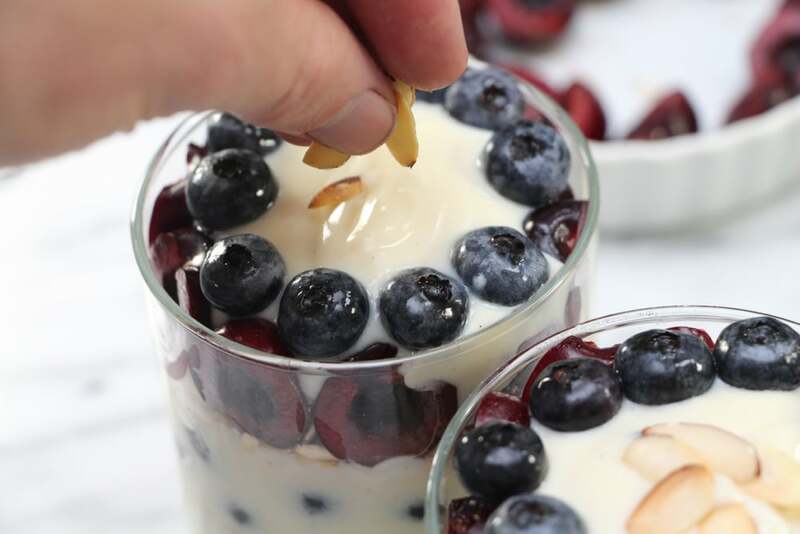 Then, place a row of cherry halves around the top of the glass, followed by a bit more youghurt and a row of blueberries. 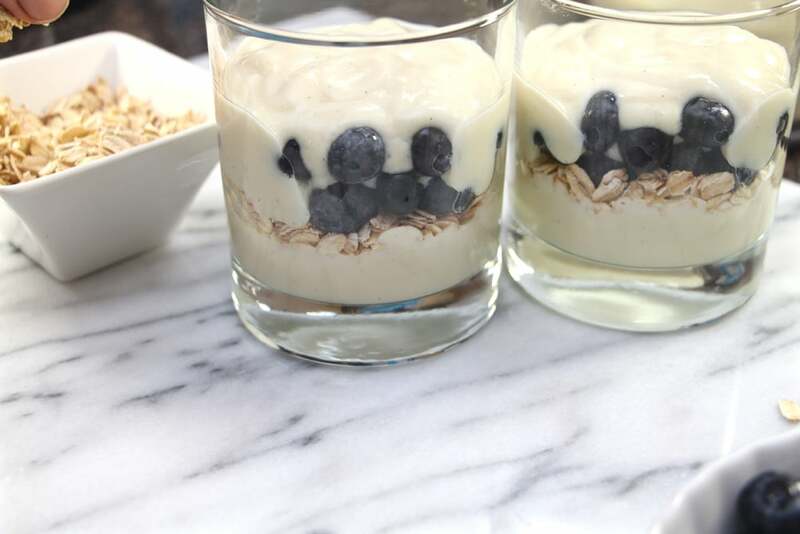 You could add a sprig of mint, or a few oats to the top. My favorite thing, however, is a few toasted slivered almonds. You can customize this for your tastes. Use strawberries or raspberries instead of cherries. Try granola instead of oats. 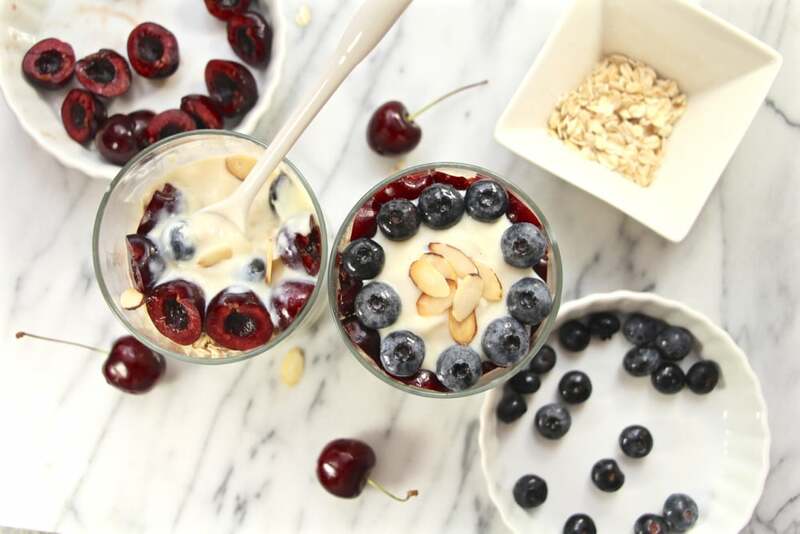 Any way you make them, parfaits are refreshing summer treats. *Despite my European, Asian and Brittish tendencies, I'm really proud to be American. Happy Fourth! I have heaps of courgette frim the garden. I'm thinking of every way to work it into my cooking. 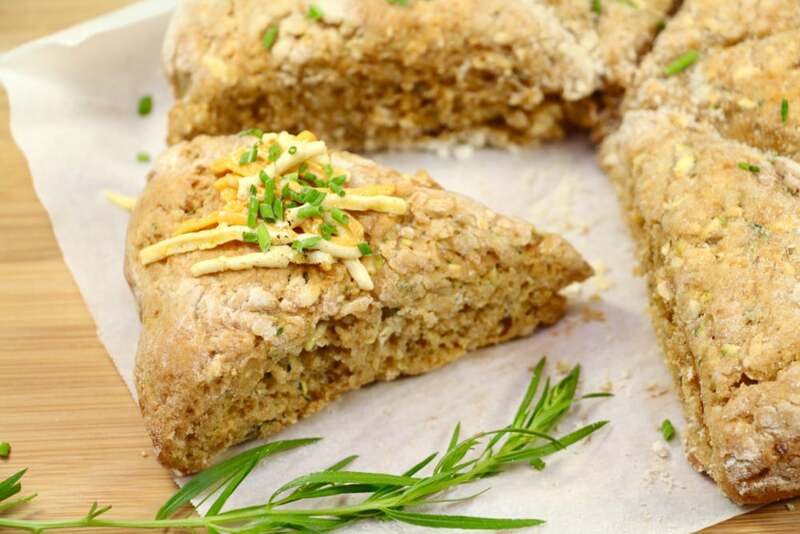 These savoury scones pack in garden-fresh zucchini. Normally, I don't like fake food. But, Daiya has a fairly good imitation cheese. Adding a bit to this dish adds a nice flavour. Using the ratio recipe found in the Ratio Cookbook, I use 300g spelt-wheat flour blend, 100g coconut oil and 200g almond milk. And, baking powder. To make it savoury, smoky and flavourful, I use: smoky paprika, onion powder, garlic powder and an extra bit of salt. 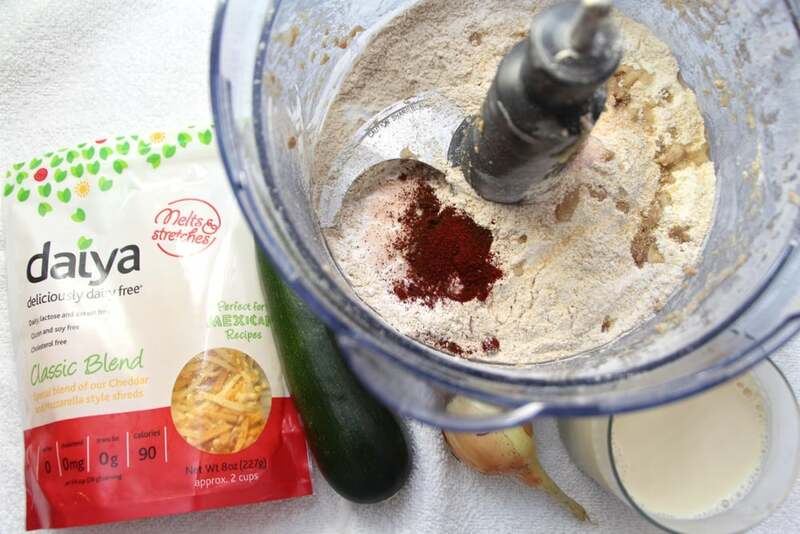 In a food processor, add the flour, baking powder and solid coconut oil. Blend until crumbly. 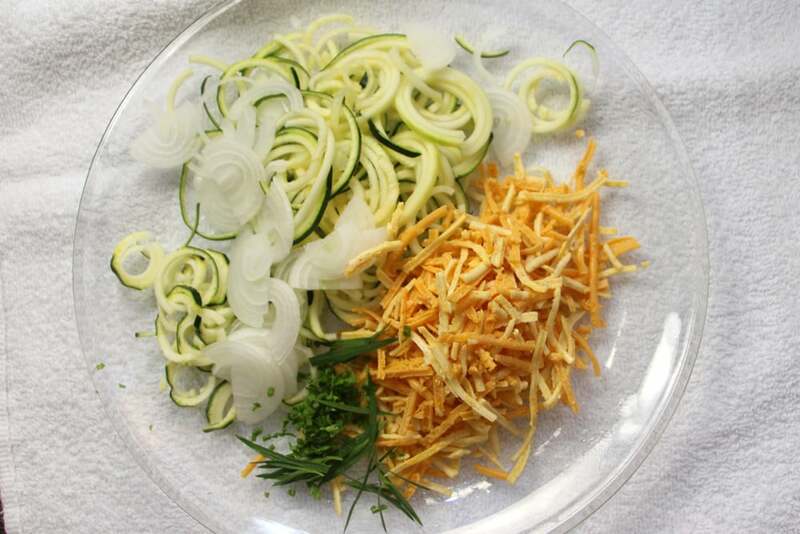 Then, add in the almond milk, spices, salt, "cheese," and grated zucchini. I also added chopped onion and tarragon. Blitz a few seconds - just until the ingredients are mixed. Any more mixing and it'll make a tough a tough scone (and it would completely smash up the zucchini). 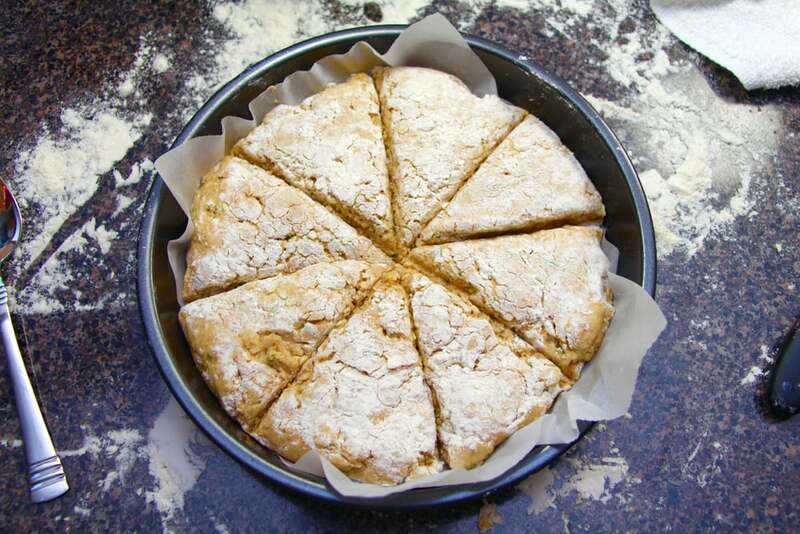 Gather the dough and press into a parchment lined baking round. Bake at 180˚C (350˚F) until the tops are golden brown. Serve warm, garnished with a bit of "cheese" and chives. 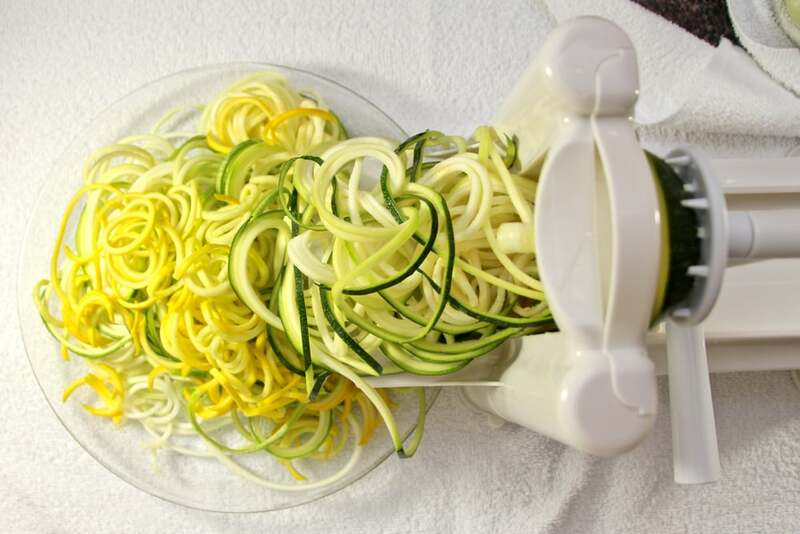 I just got a Spiralizer! I love it. 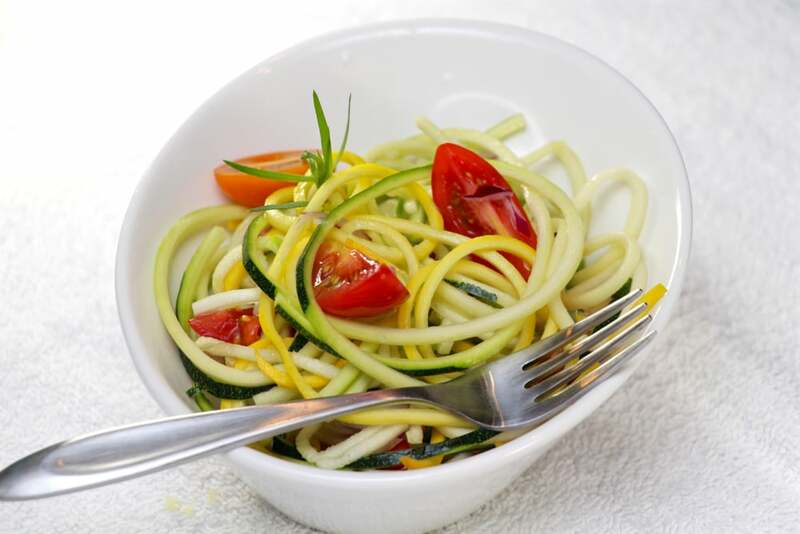 Here's a light and flavourful dish using summer squash from the garden. 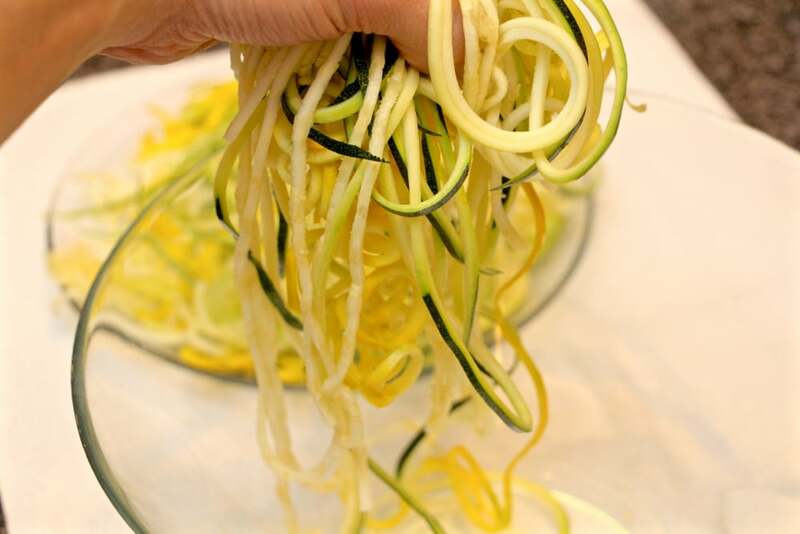 Start with a couple medium sized courgettes (zucchini) and run through the small spiralizer blades. Halve, or quarter, a dozen cherry tomatoes. Dice half of a small red onion. Add all the ingredients to a mixing bowl and season with salt. 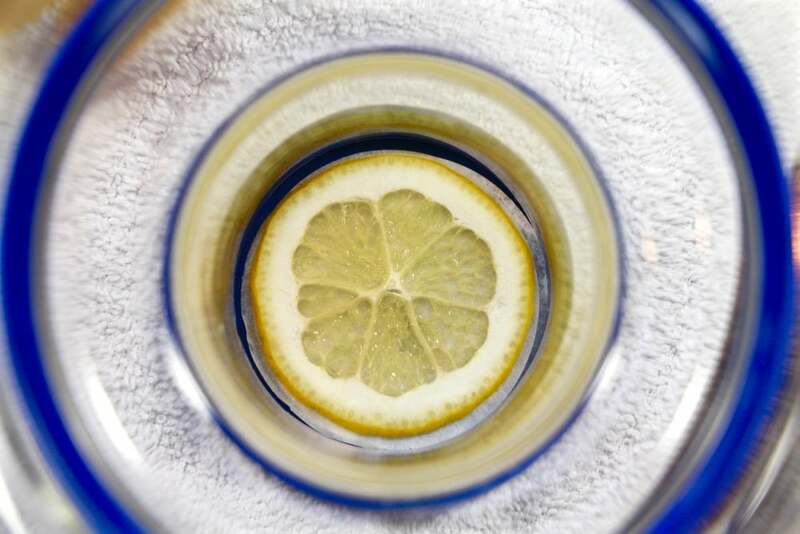 Squeeze the juice of a lemon over the mixture and toss lightly. Garnish with fresh herbs: parsley, tarragon and basil. 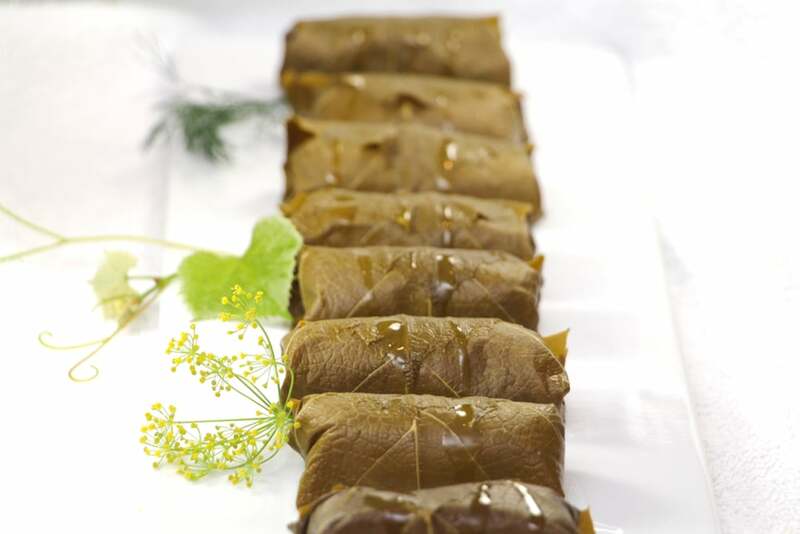 With grapes on the vine and leaves to spare, it's time to make dolmades! There are several types with different filling. I like a nice savoury eggplant and rice filling to make the perfect doma. Start by roasting an eggplant (aubergine). I like to score it, salt it and drizzle on olive oil. 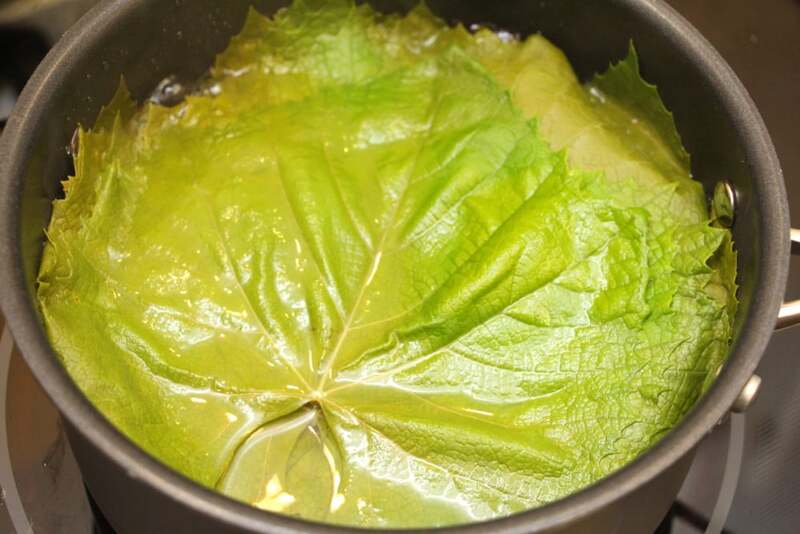 While it's roasting, plunge the grape leaves in boiling water. Continue to cook them until they're tender. Also, prepare a bit of rice to add to the filling. I like to use brown jasmine rice. It imparts a nice texture and a subtle, delightful flavour. 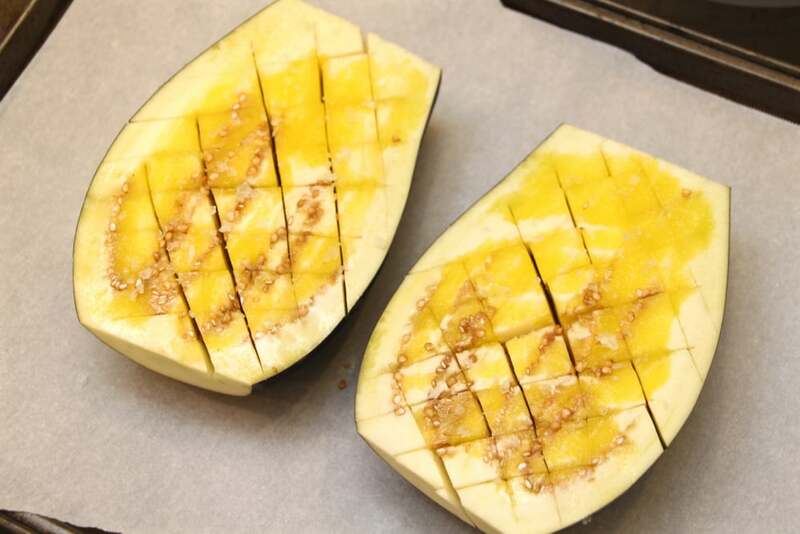 When the eggplant is mushy and browned, remove it from the oven and allow it to cool. When it's cool enough to handle, scoop out the flesh and combine it with a bit of rice. I use nearly equal portions of each. Then, mix in a bit of turmeric, onion powder, lemon juice and salt. 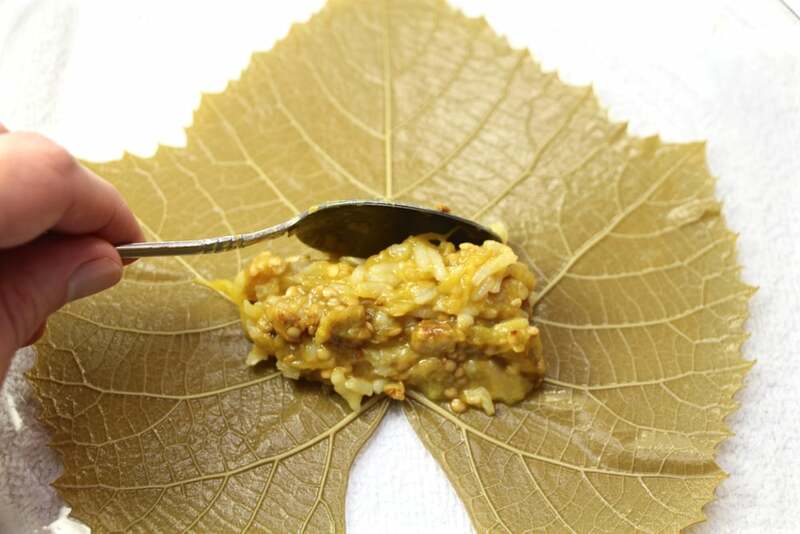 Place a spoon of the filling mixture onto a grape leaf and roll it up - kinda like a little burrito. 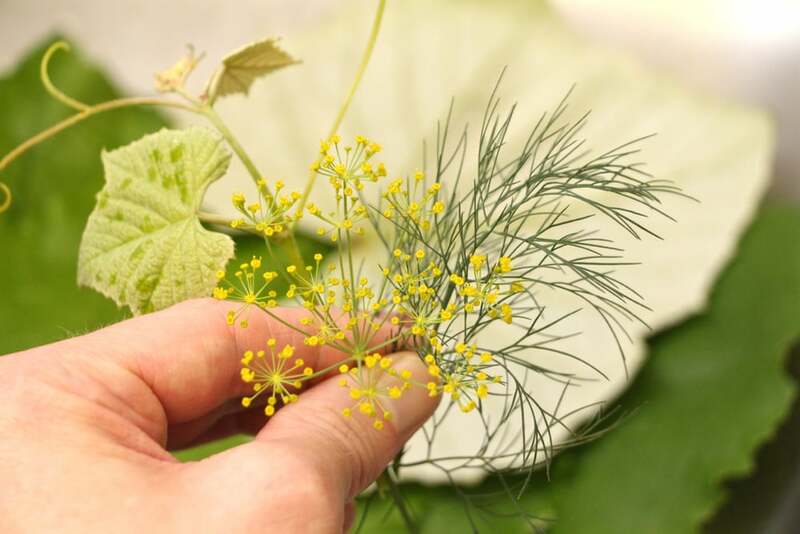 Garnish with dill and drizzle with olive oil. 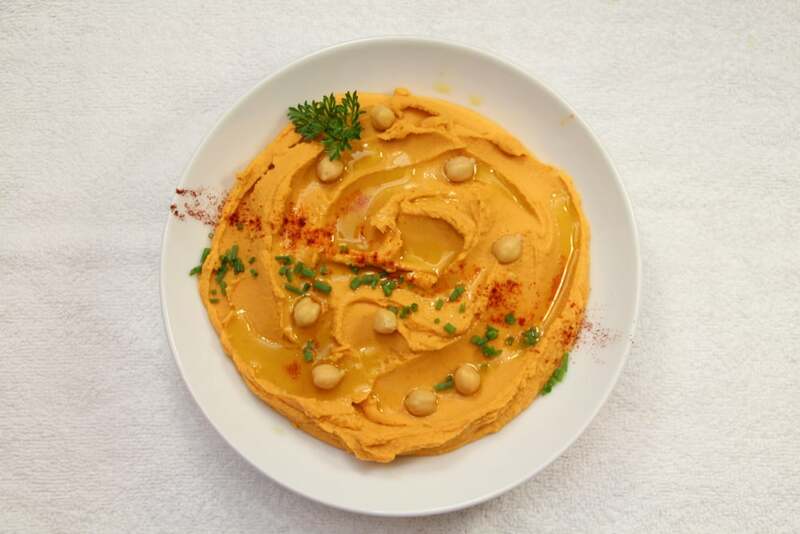 Smooth, smoky and tasty; this hummus tastes like summer. I hesitate to liken this hummus to "barbecue" flavour since it can mean so many different things. But, it's kind of like barbecue potato chips (my weakness). Start with the spice blend and the basic hummus ingredients: garlic powder, smoky paprika, onion powder, salt, olive oil and lemon juice. 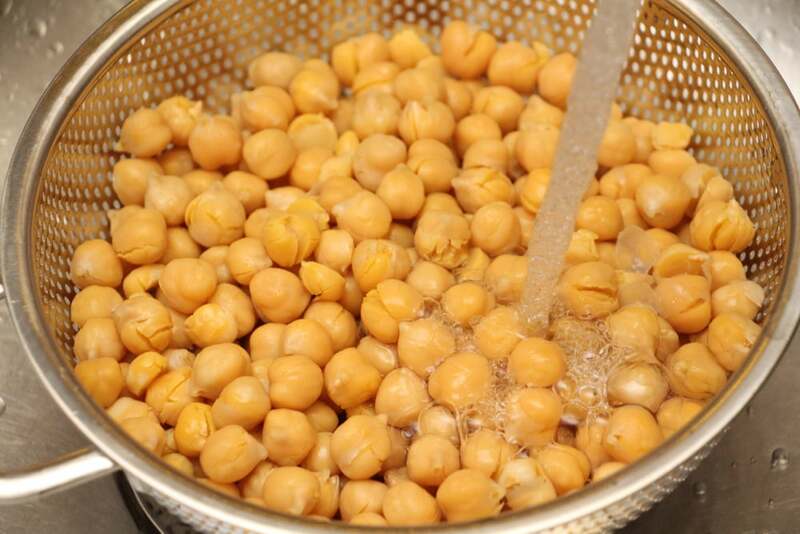 I use tinned chickpeas, but I always make sure to wash them. This rinses away the thickeners and some of the gas producing compounds. 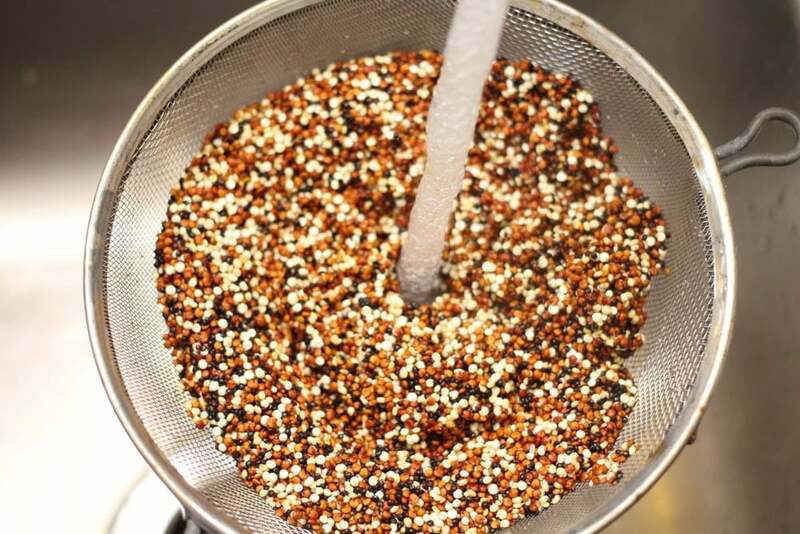 Add all the spices, the oil and lemon juice to a food processor, or high powered blender. (I used a Vitamix). 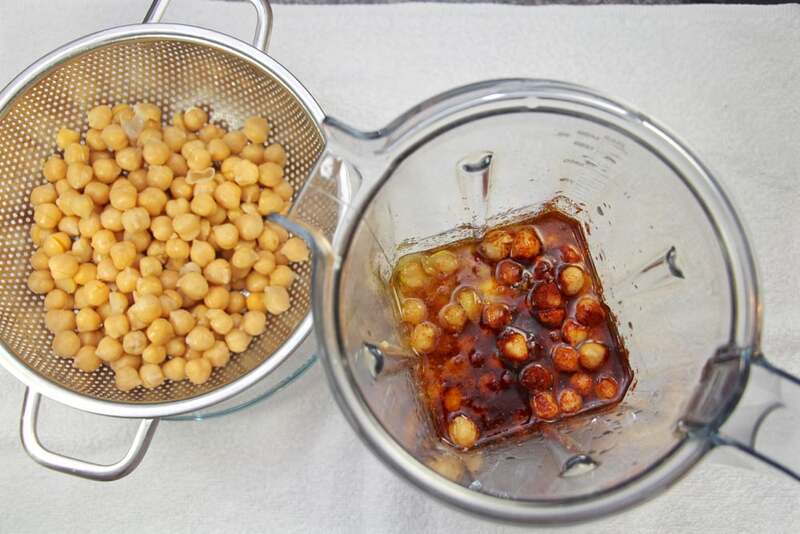 Then add a bit of water ~250ml, and half the chickpeas. It's important to add only half if you're using a blender. 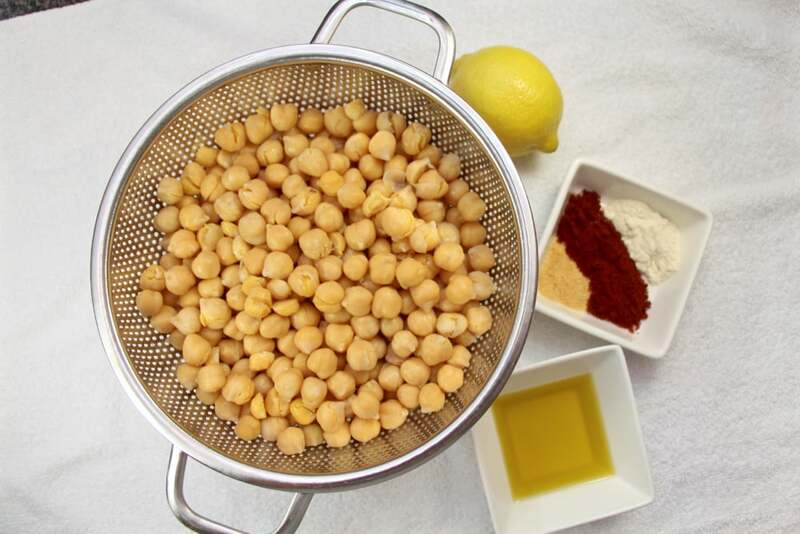 It allows the ingredients to liquify, which makes it easier for the rest of the chickpeas to integrate in the blender. 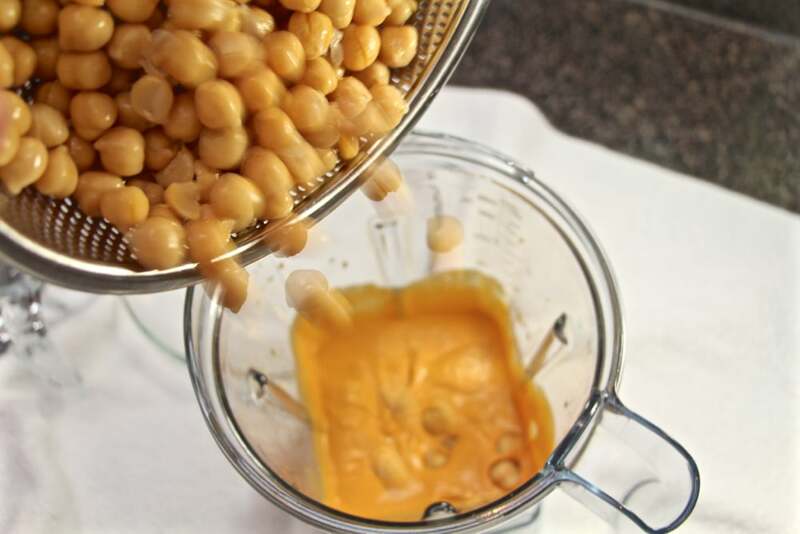 Puree until the ingredients are liquified, then add the last half of the chickpeas. 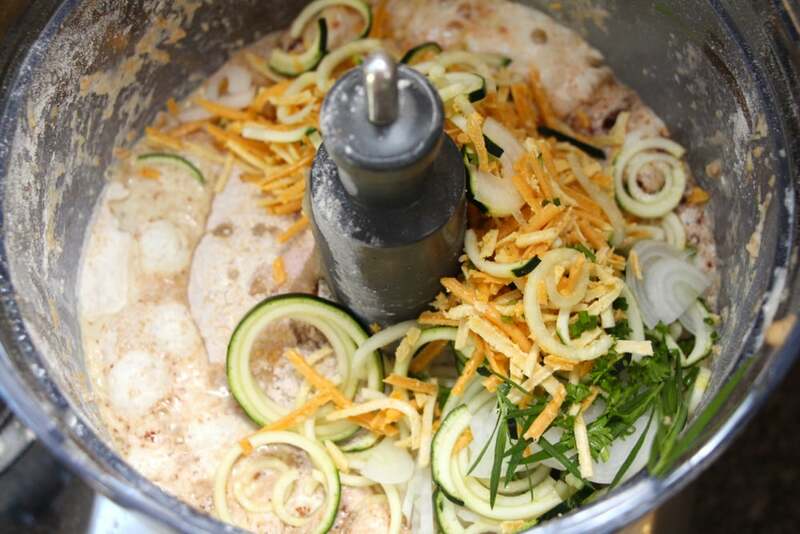 Blend until smooth, adjusting the seasoning and liquid (oil and water) to suit your tastes. Enjoy this smooth, smoky spread with pita bread, or in a veggie wrap. Baklava is one of those things I never really liked. I was accustomed to the pre-made slobbery, greasy, over-sugared, store-bought baklava. It just isn't the real thing. After visiting Turkey, I got a better idea of what makes a good baklava, so I perfected a recipe. But it was laden with butter. I wanted to make a version that was completely vegan and tasted just as good. I didn't capture all the sequence of photos for this batch. Check my original baklava recipe for more detail: http://jlamode.com/baklava/ Start with a blend of nuts and coconut. I like pistachios, pecans, walnuts and almonds, all in equal portions. 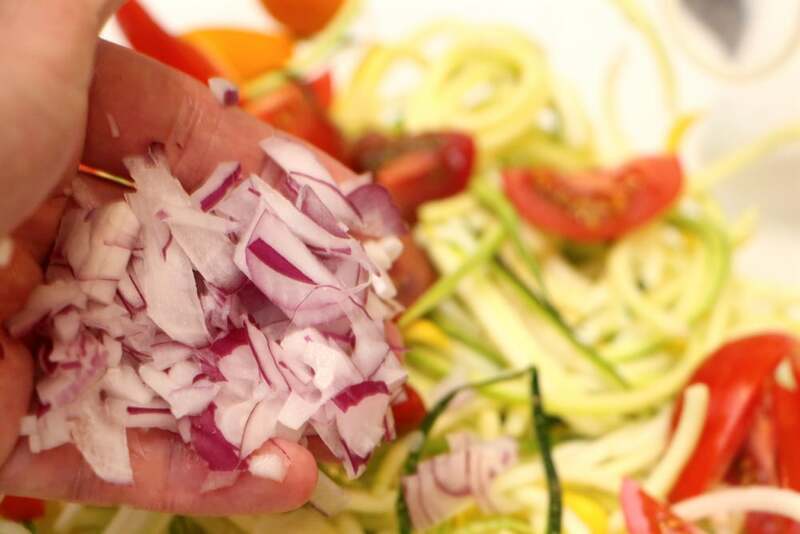 Chop them a little bit coarsely in a food processor and set aside. 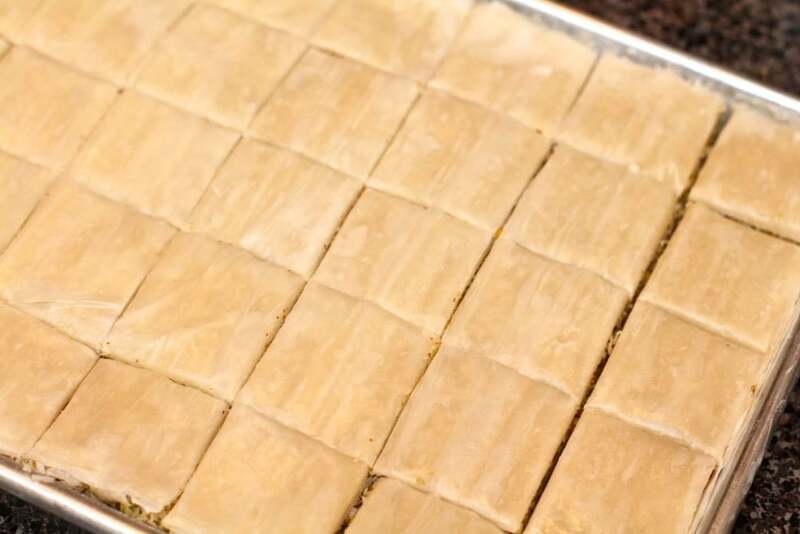 The time consuming part of baklava is in the pastry. 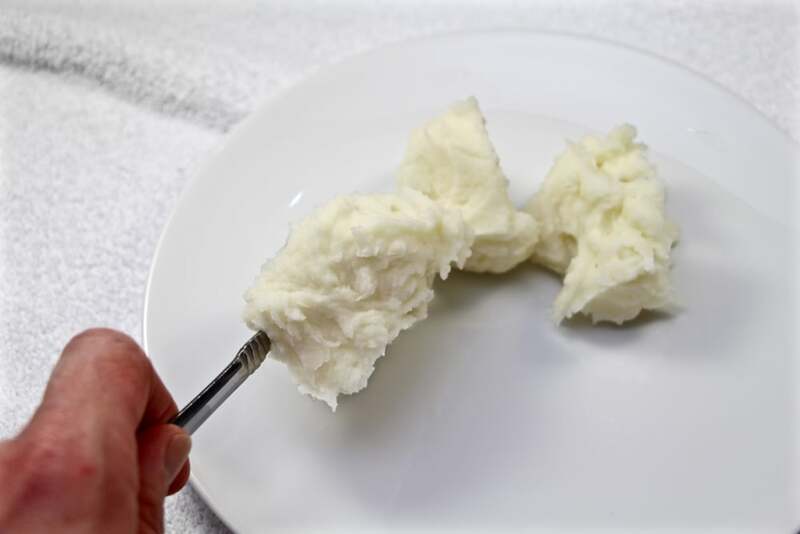 It's easy enough to buy filo dough, but it has to be layered and brushed with coconut oil. I start out by brushing the pan with oil, then a sheet of dough, then brush with oil. I like to have 10-12 layers of dough for the bottom crust. Then, add the nuts, about a centimetre deep. The top pastry is the same procedure as the bottom crust, 10 layers of filo dough, brushed with coconut oil. 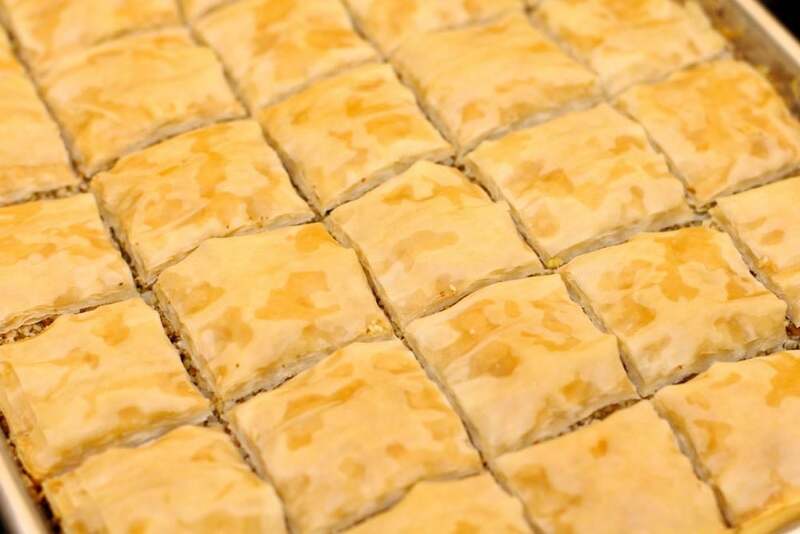 It's important to cut the baklava prior to baking. Then bake ~20-30 minutes, or until the top is golden brown, at 350˚F. The syrup is the thing that brings the baklava together. The traditional recipe calls for honey, but to make it strict-vegan I use turbinado sugar. It's sometimes called "raw," demerara or unrefined sugar. I use equal portions of sugar and water - about a cup of each. Then, I add a cinnamon stick, a few whole cloves and orange blossom water. Bring to a boil and make sure all the sugar crystals have dissolved. Set aside until the baklava is done baking. Just before removing the baklava from the oven, return the syrup to a boil and strain our the cinnamon stick and cloves. 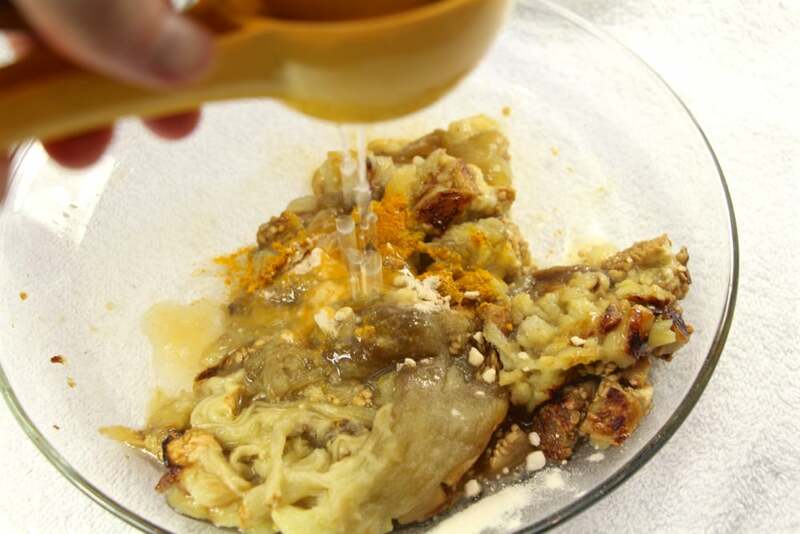 Working quickly, remove the baklava and pour the hot syrup over the pastry. I wanted to add a bit extra to these, so I drizzled the top with vegan Belgian chocolate and added a sprinkle of shredded coconut. 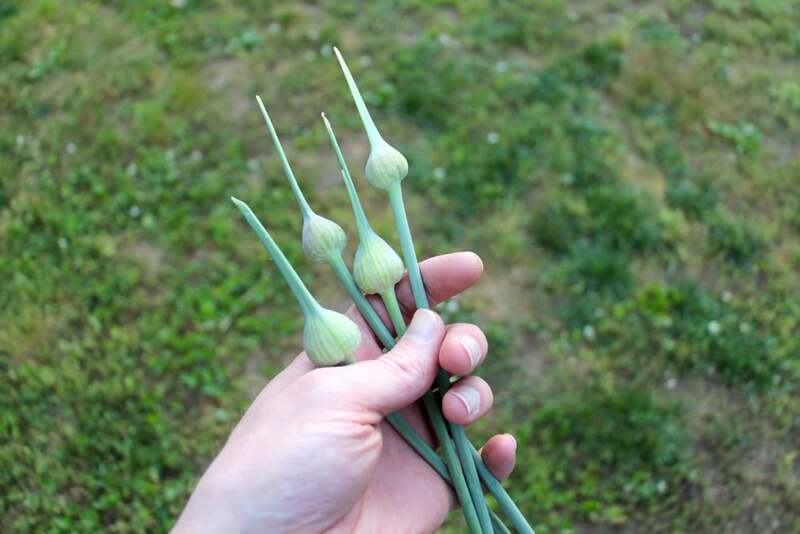 Garlic scrapes are not always easy to get a hold of. 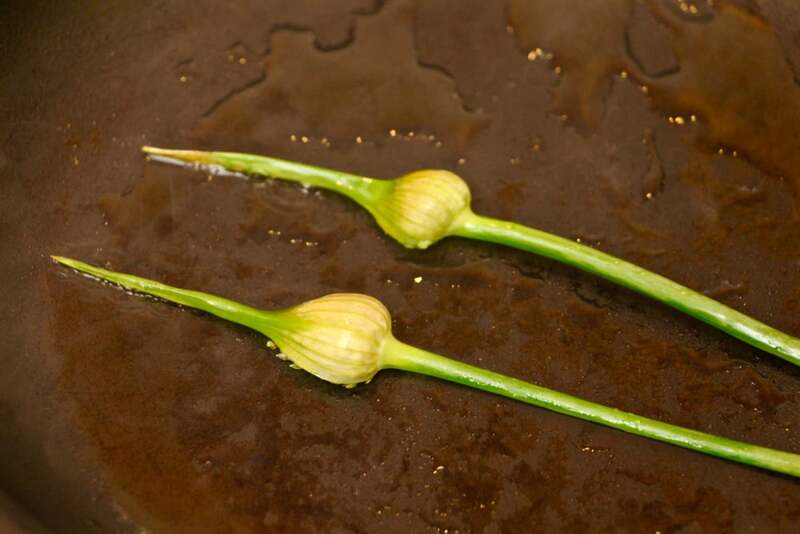 Scrapes are the shoots that a garlic plant sends up when the growing cycle is nearing completion. When they first start out, they're tender and tasty. If they go too long, they get tough, so catching them early is key for a good dish. These scrapes come from elephant garlic. 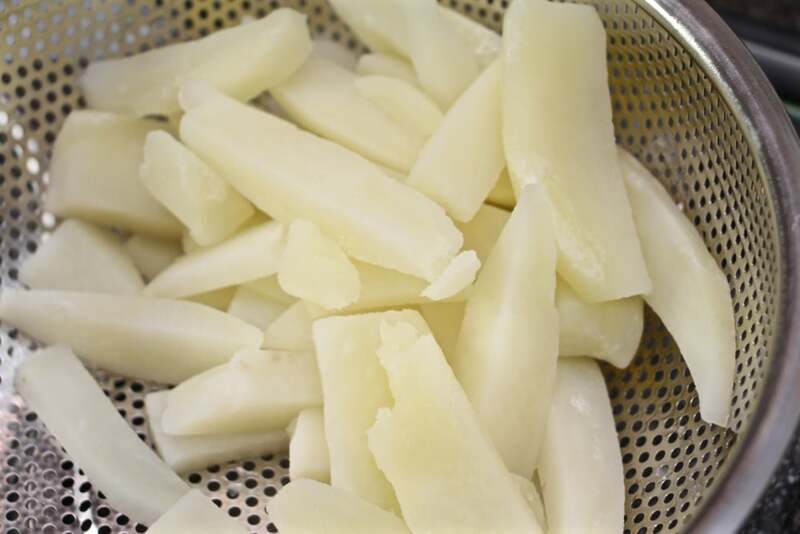 Start by peeling and boiling a few potatoes in salted water. When they're done, drain them and set aside. 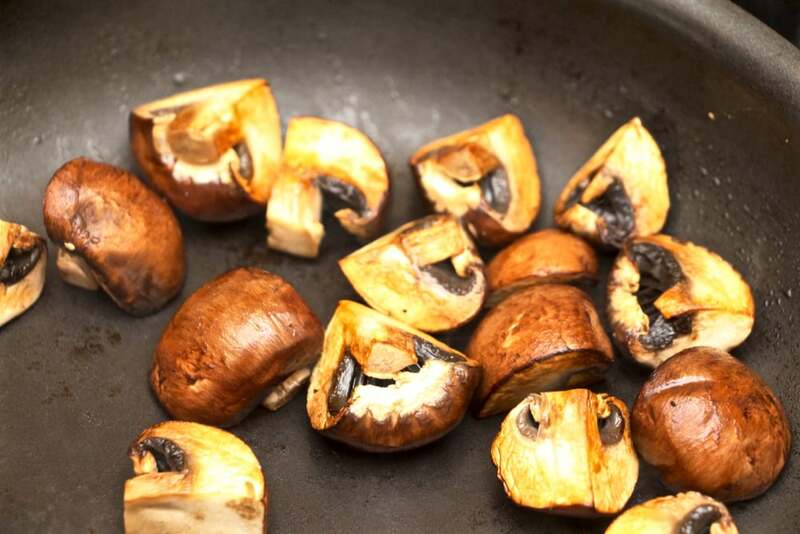 Quarter and sear a handful of baby portobello mushrooms in olive oil. Then, in the same hot pan, sautee the garlic scrapes. I like to sear the bloom end to add a nice aesthetic. 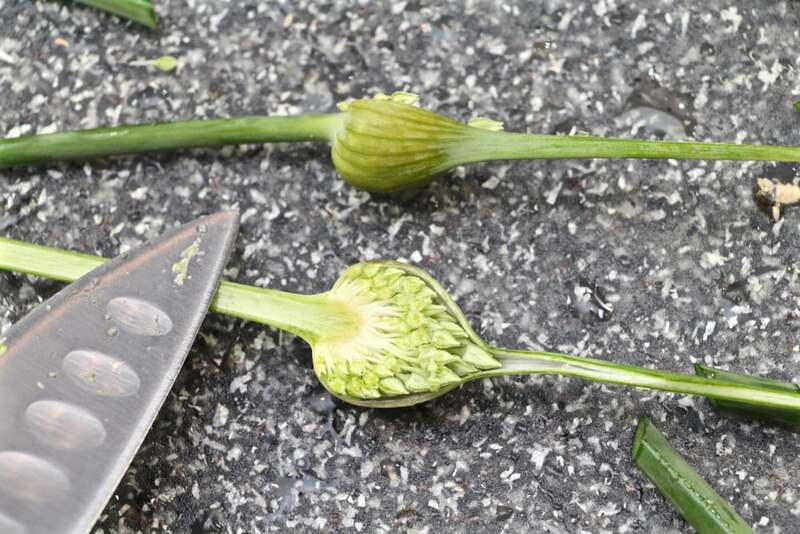 The blooms themselves can be a bit tough, so it's more for garnish. Whip the potatoes with a bit of earth balance and almond milk. Season as needed with sea salt. Begin plating by spooning the potatoes on the plate. Then add the mushrooms and scrapes. Finish with a few seared blooms. I haven't done a book review in quite a while. This one is noteworthy! A while ago, I wrote about Austin Kleon's last book, Steal Like an Artist. This one is equally amazing! I literally bookmarked about half of the pages. It's full of wisdom; it inspires. Kleon writes about one of my favourite things: Ira Glass' explanation of Being Creative (video below). I've found this concept to be so true. I look back at my early work - it's gross, it's only relevant to me and I'm nearly embarrassed by it. But, I shared it anyway - I wanted to share things with the world even if they weren't perfect. Sharing something every day involves the audience in the creative process. It gives them a chance to provide feedback and to gain value by watching the content creation process. It also helps the content creator cultivate an understanding of the audience. As much as artists like to express themselves, it's important to understand that fine line between creating for the audience and personal creation. Sharing regularly, even if it's not on a daily basis, is one of the best ways to feed this interactivity. And, last, something that's aggravated me for some time. When people ask, "Follow me back?" - it's the saddest question on the internet. I don't know exactly what irritates me about that question, but it's kind of like being invited to a party where I wouldn't fit in. Because, if I really liked a person's work, I would have already followed them. Instead of asking someone to follow you, create irresistible content. And then, Show Your Work! With the fresh things starting to grow in the garden, this quick and easy dish is perfect. 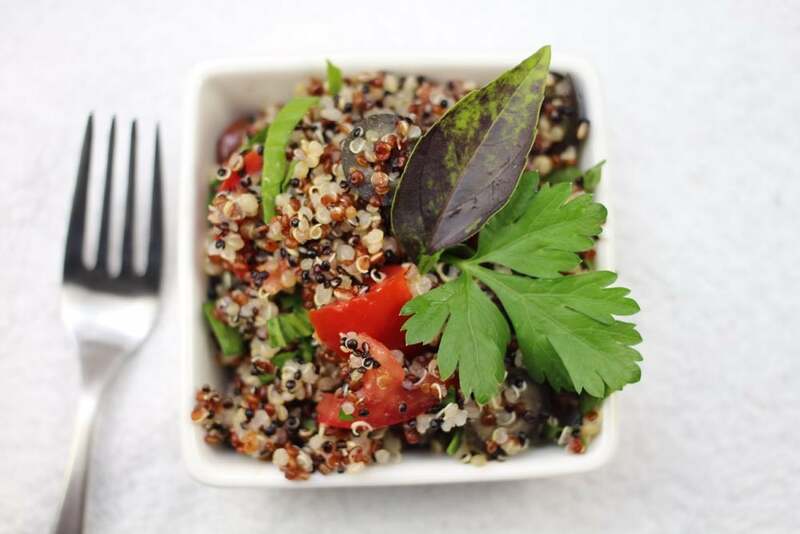 Quinoa is a pseudo-cereal. 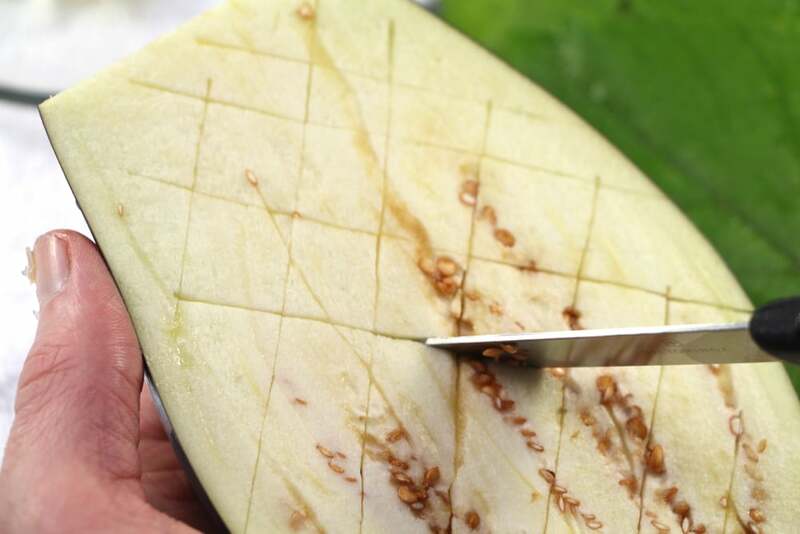 It kind of acts like gain in cooking, but is actually a gluten free seed. It's really versatile, too. 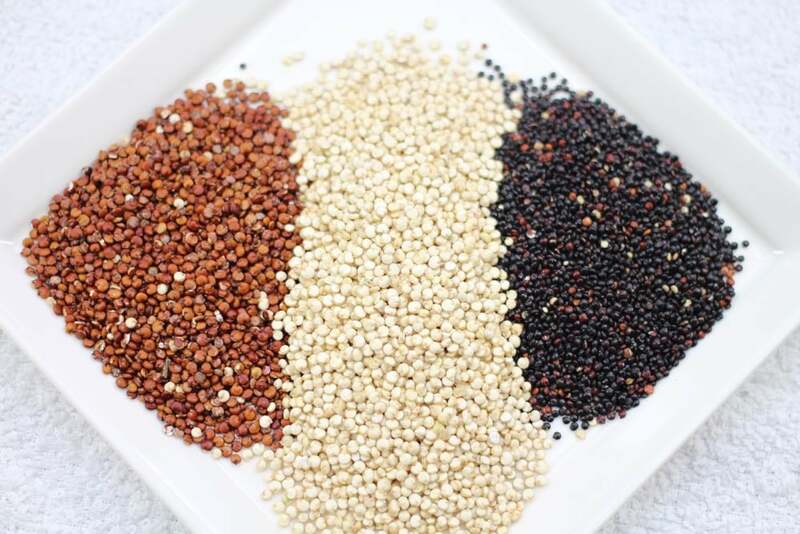 I like to use a tri-colour blend: red, white and black quinoa. First, it's important to wash the seeds to prevent any bitterness. Cook according to the instructions. I like to use a rice cooker to make things easy. While it's cooking, prep the vegetables and herbs. 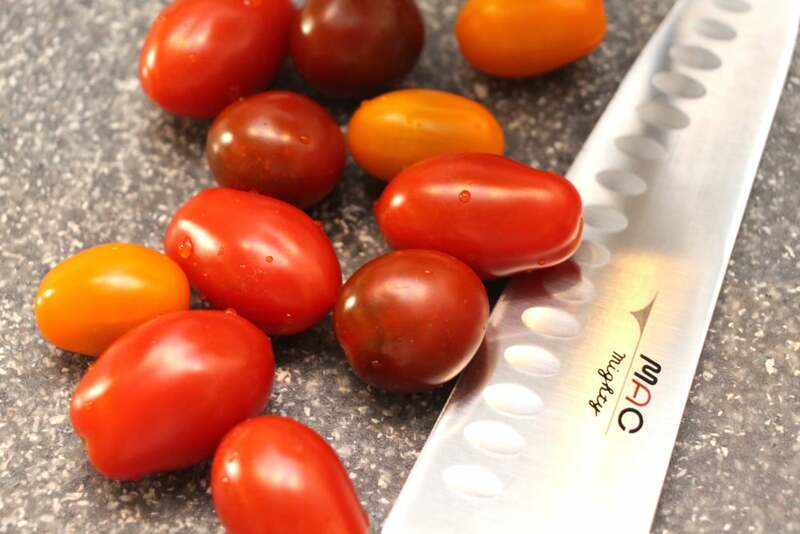 I like to use: sliced black & kalamata olives, parsley, basil, garlic greens, diced tomatoes and chiffonade spinach. When the quinoa is done, allow it to cool slightly before adding the vegetables. 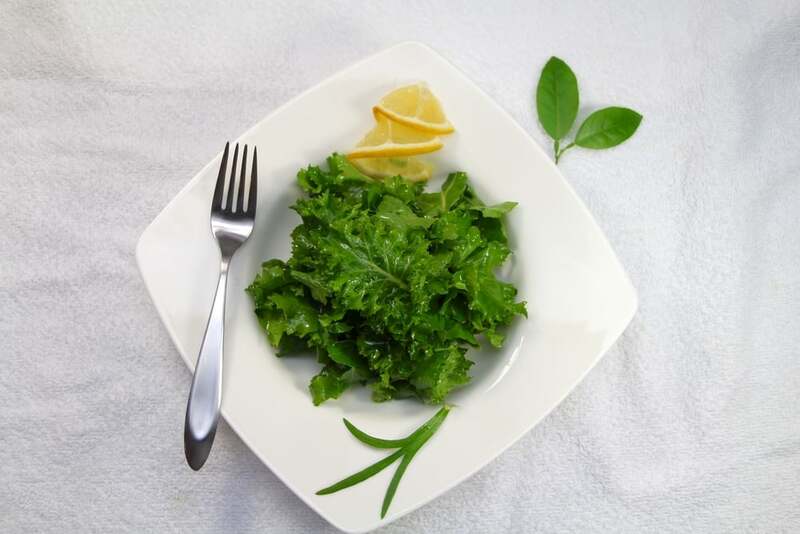 Season with salt and dress the salad with a vegan Italian dressing. 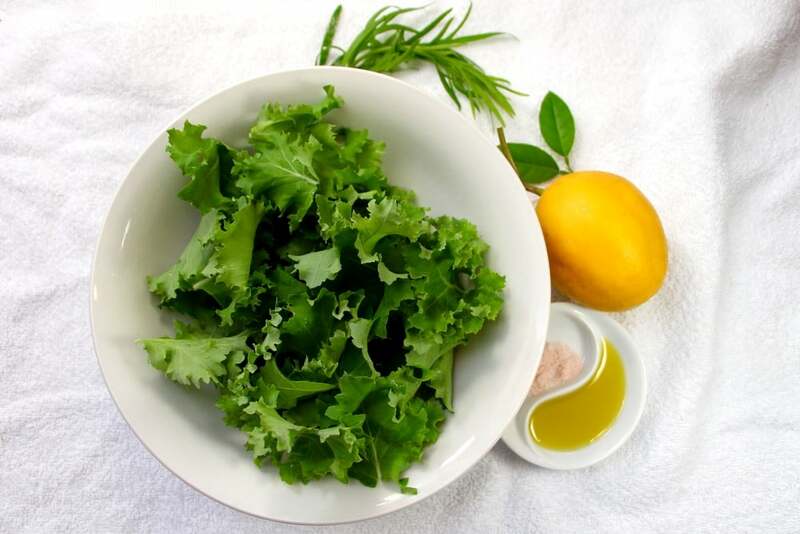 Typically, I like to make my own dressing with balsamic and olive oil, but Italian dressing is a quick and easy cheat! It makes cold brew coffee easy and accessible. I want to share my recipe for sweet, tasty, candy-like cold brewed coffee. Start with a high quality bean: something naturally processed and/or Ethiopian. Other beans can work, but I prefer a light roast. It's perfect by itself, but I like to add a bit of citrus peel to boost the sweetness and add another dimension of flavour. These are meyer lemons from my trees. I brew, almost exactly, according to the Bruer instructions: 50g-60g medium ground coffee. I like to serve it by diluting it slightly and pouring it over ice. Also, mixing in a 50:50 ratio of coffee:Perrier. It's the taste of summer! Kale from the garden and meyer lemon from my trees! 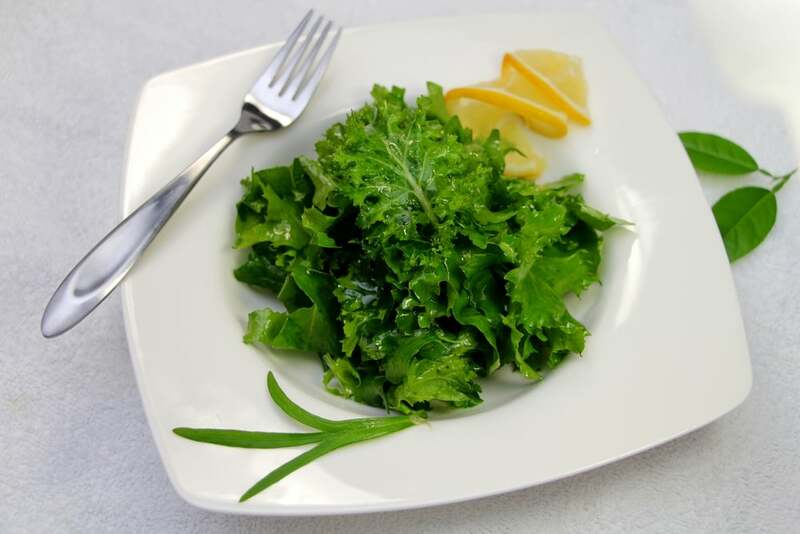 Lemony kale salad is a quick easy and healthy side dish. 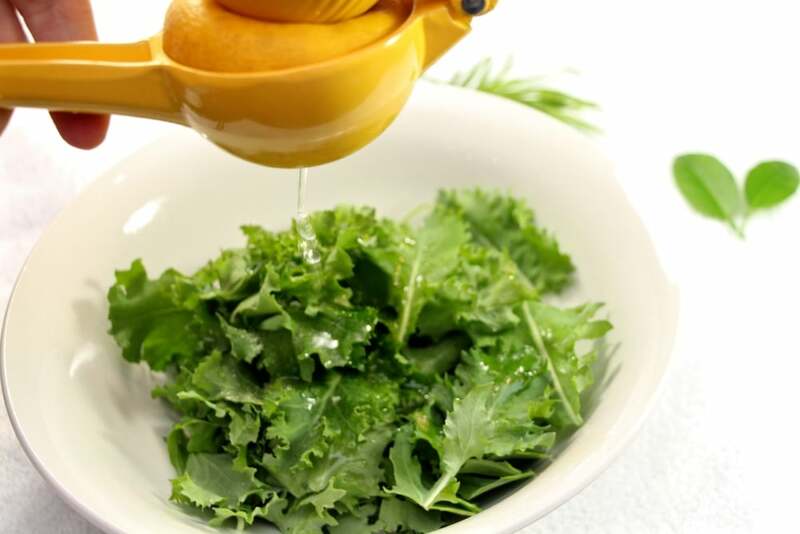 First, wash, dry and tear the kale into bite sized pieces. Drizzle with a bit of olive oil and season with a pinch of salt. 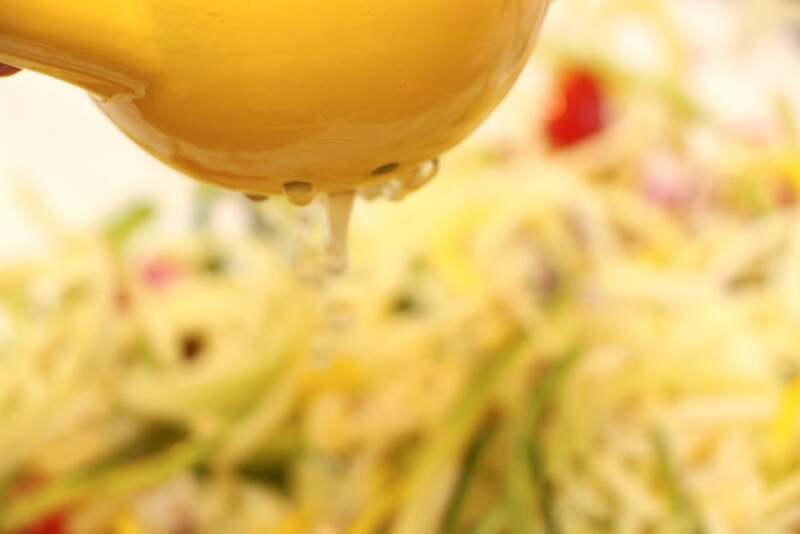 Then, squeeze in a bit of fresh lemon juice and mix gently. Last, I like to add a bit of tarragon for an extra flavour dimension. 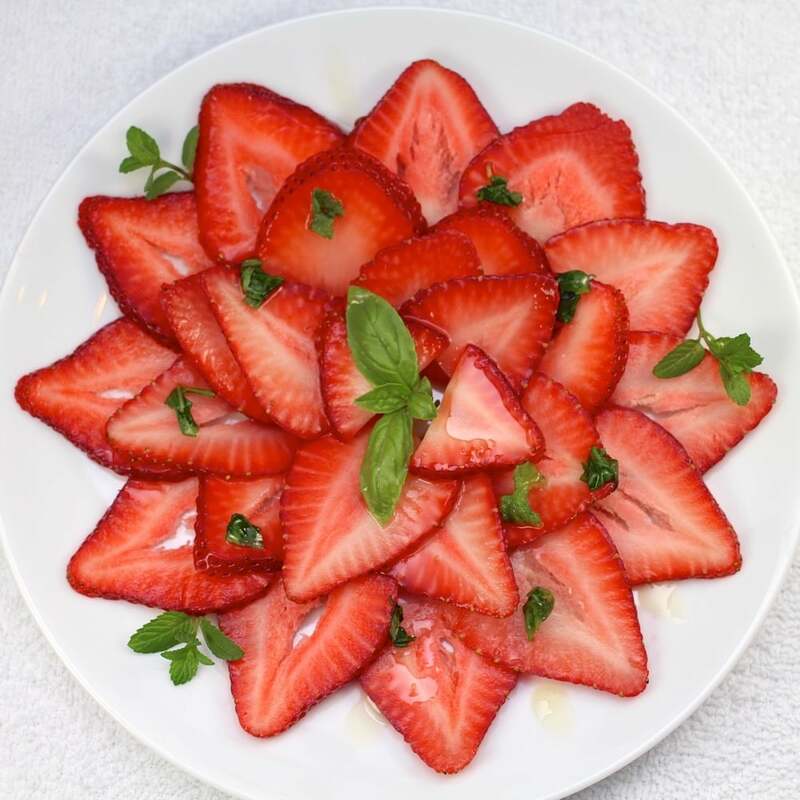 First, thinly slice a few strawberries. I used about five berries - the largest slices, not the edge slices. Consistent size it fairly important. 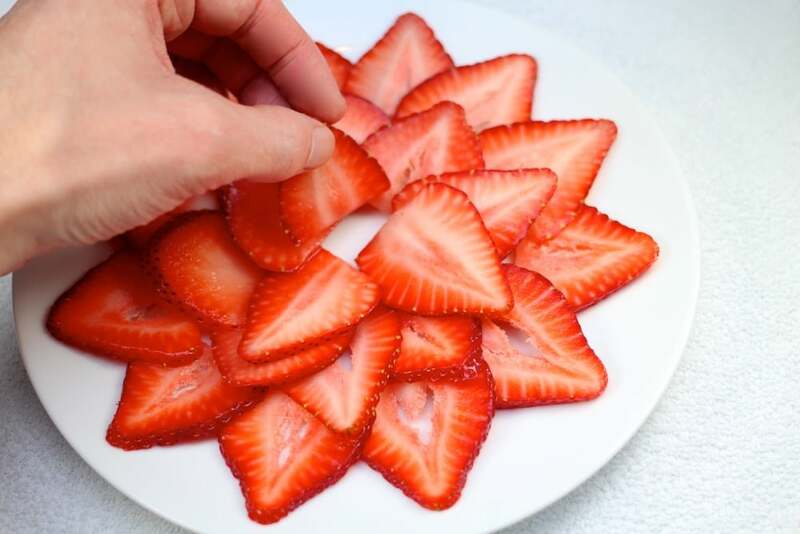 Then, arrange, in a radiating pattern, the strawberry slices. 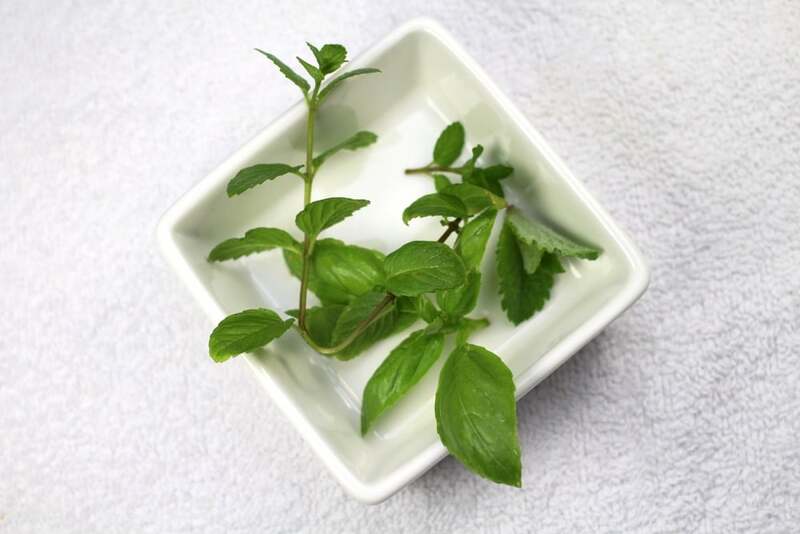 To create a bright flavour, I added mint and sweet basil. 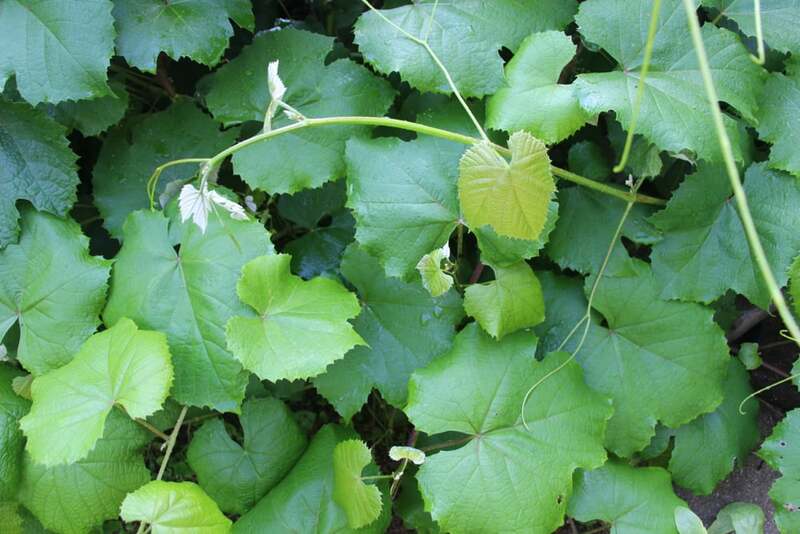 Remove the leaves from the stem and add a bit of agave syrup. Then, muddle the leaves and syrup to release the fragrant oils. Drizzle the syrup on the berries and arrange the bruised leaves. Garnish with sprigs of whole basil and mint. Enjoy! First, measure and combine the cornstarch, xanthan gum and vegan cultures. 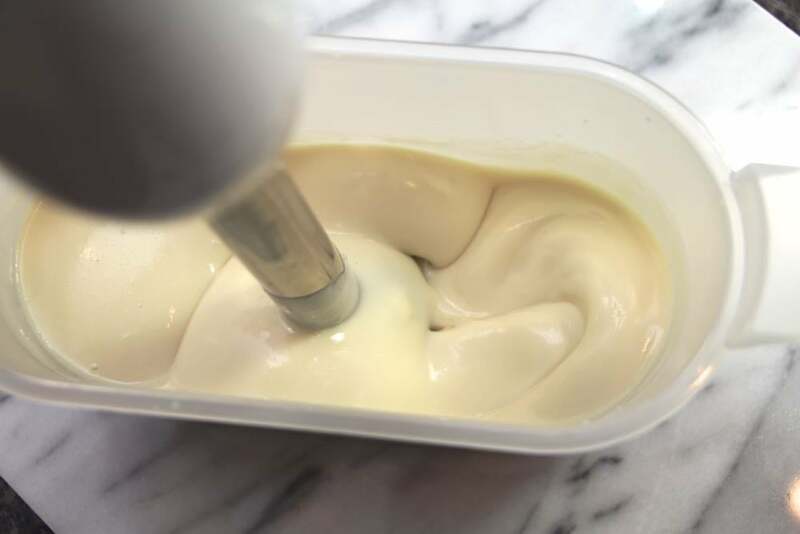 If you're using an automatic youghurt maker, you can just mix everything in the container. Otherwise, a large measuring mixing bowl works well. 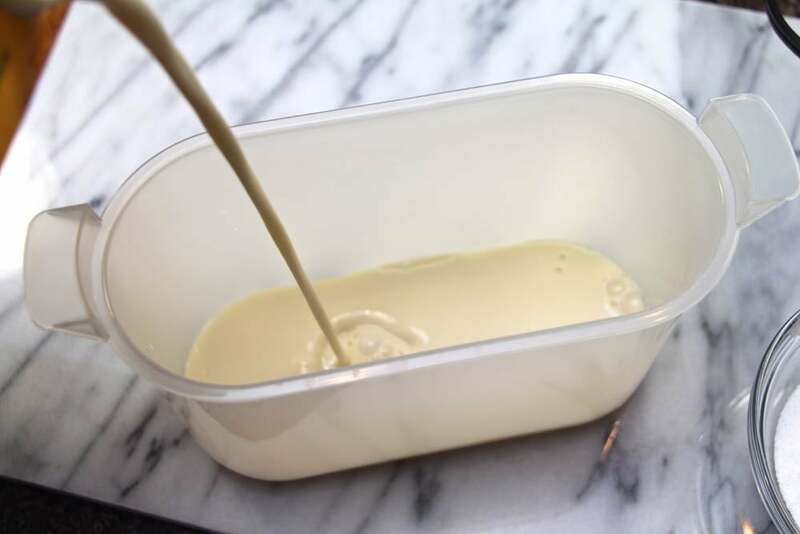 Pour half the litre of Silk into the mixing container and mix in the dry ingredients. 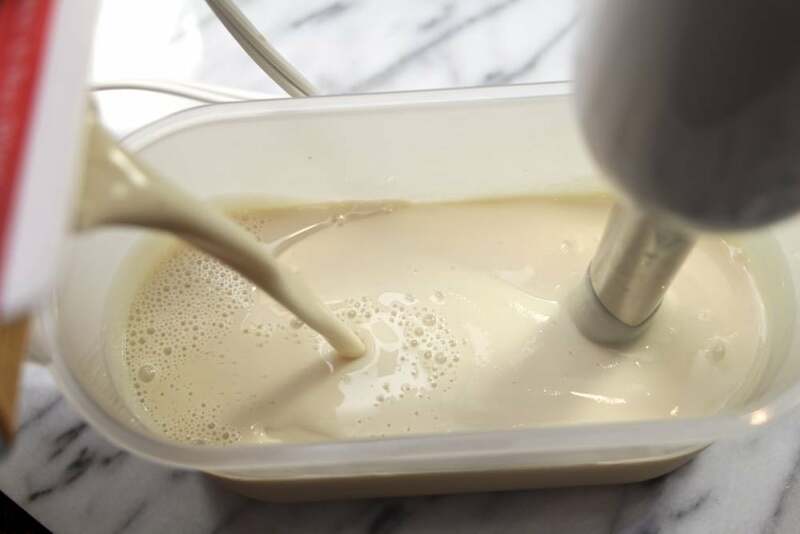 Using an immersion blender, mix until completely smooth. Then add the remaining half-litre of Silk and mix until incorporated. 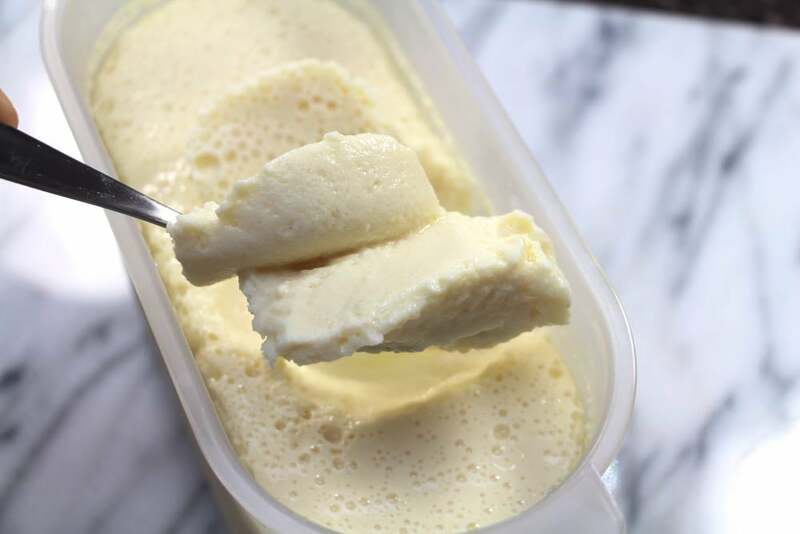 If you're using the Cuisinart automatic youghurt maker, I find that 7 hours works best (starting with cold milk). 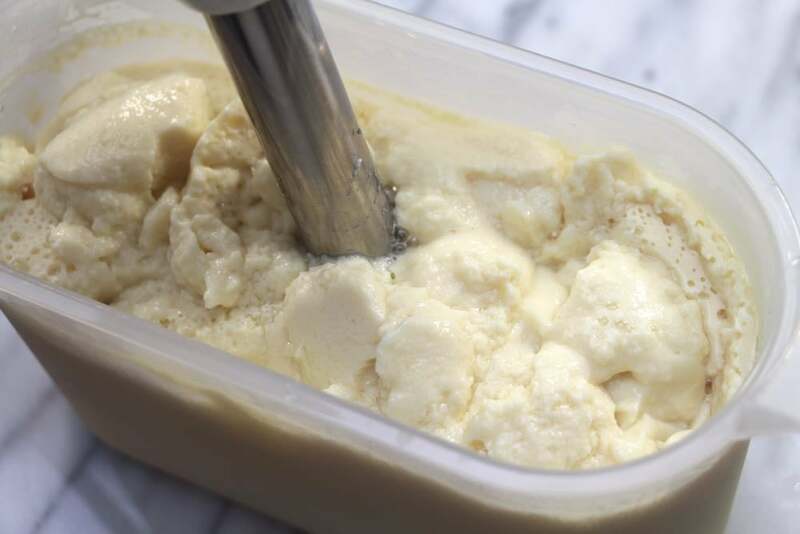 If you're using a traditional youghurt maker, start with 6 hours and check the progress until it's ready. When it's done, it'll be nearly chunky. 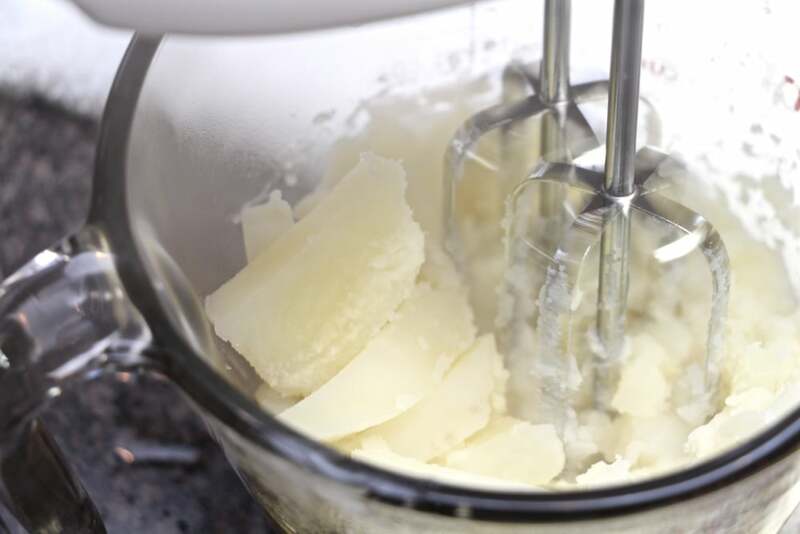 Once more, run the immersion blender through the mix until it's completely smooth. 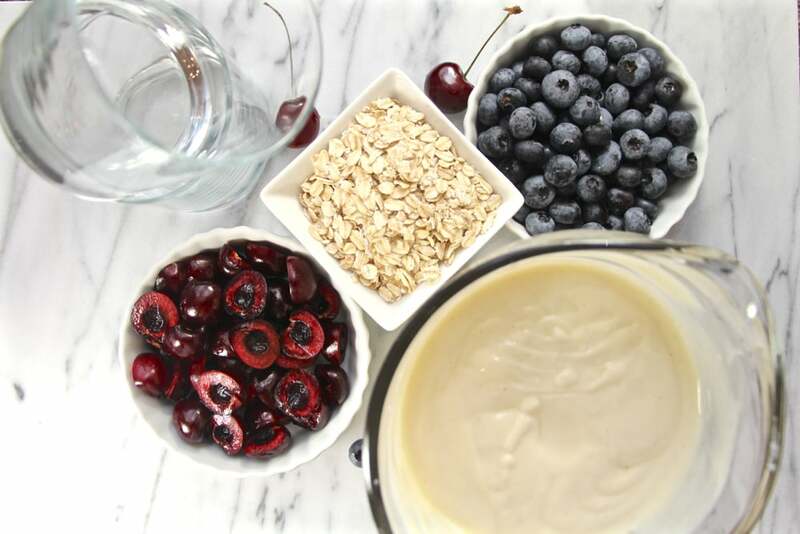 I like to serve it with granola, youghurt, fresh or frozen fruit and a drizzle of maple syrup. 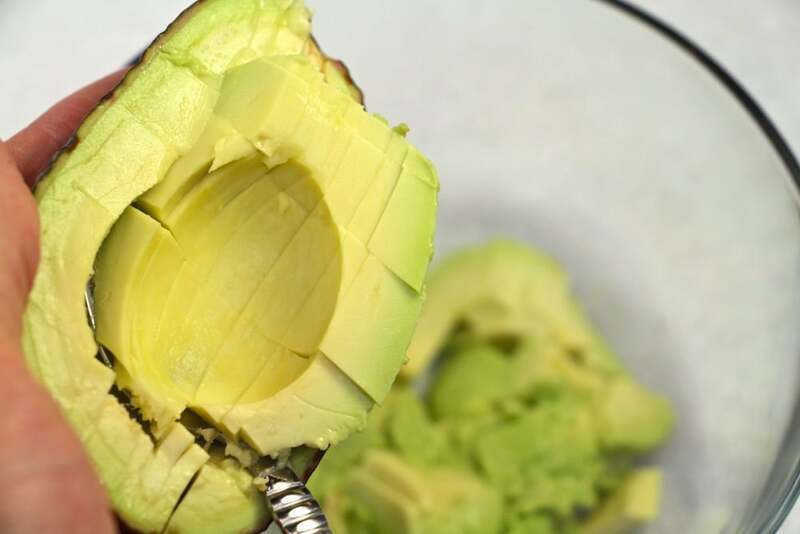 How can you go wrong with avocado?! 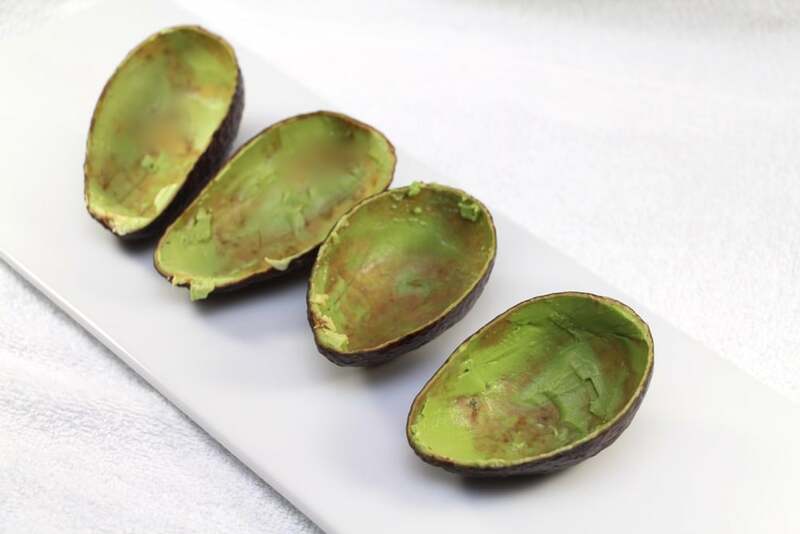 This dish uses of the avocado shell to make a perfect bowl for the guac. 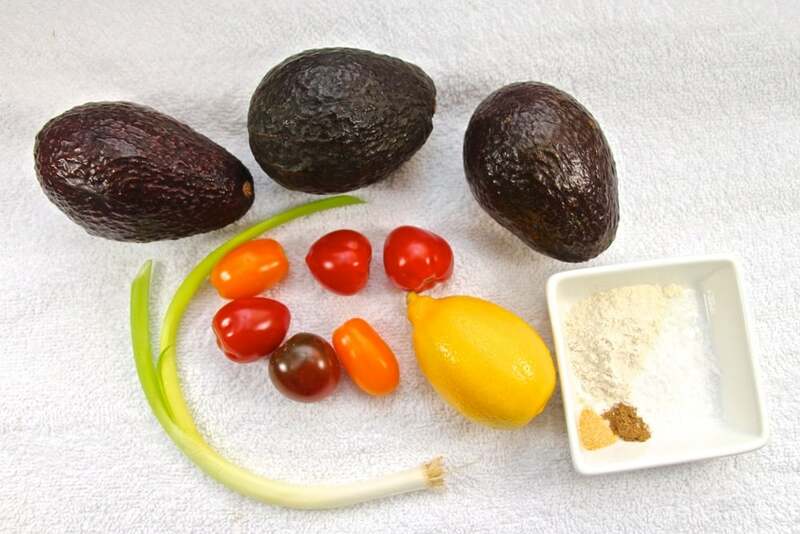 You'll need the regular ingredients for guacamole: avocados, onion, lemon/lime, tomatoes and seasonings. I chose to flavour this one with garlic, onion powder and cumin. 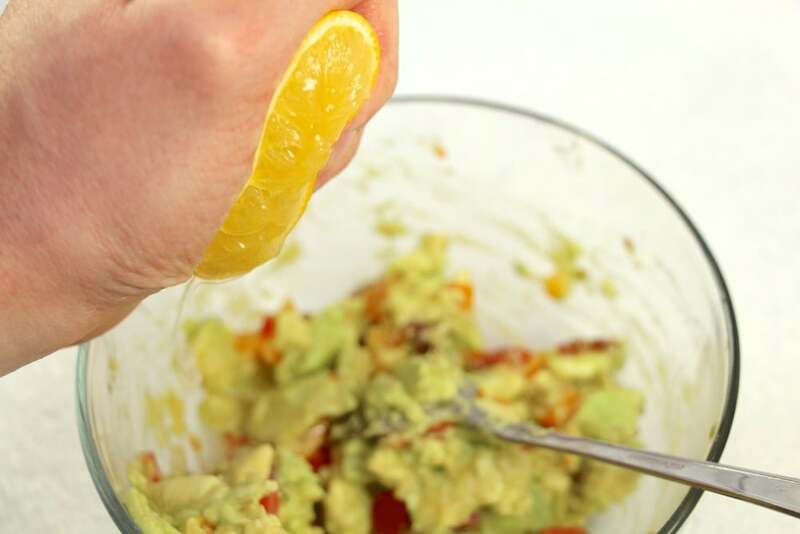 Carefully halve avocados, taking care to keep the peel in good condition. Dice and scoop out the flesh, adding it to a medium mixing bowl. Add the minced tomatoes, seasonings and a squeeze of lemon. Mix well, but don't completely smash up all the chunks. They provide a varied mouth-feel throughout, making for a unique treat. 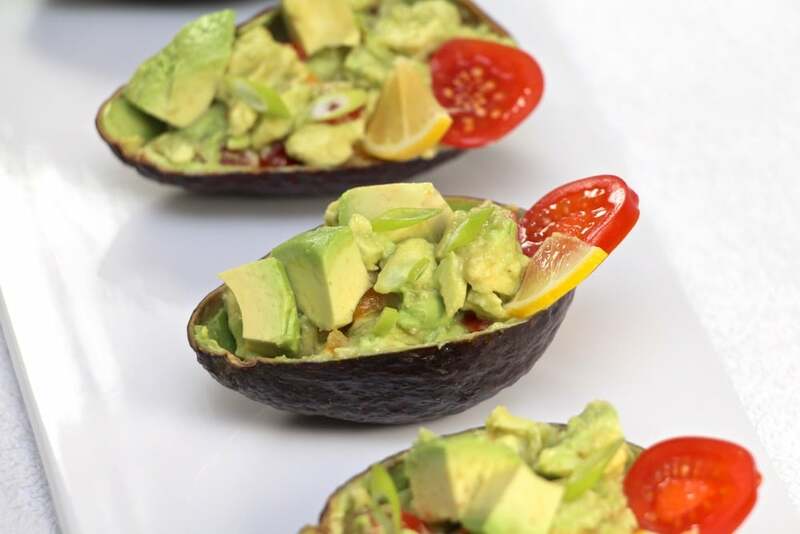 Arrange the chunky guacamole in the empty avocado shells and garnish with slices of tomato, green onion and lemon. So often vegan cookies taste "healthy." That is, they're unfit for human consumption. Since it's my mission to make delicious vegan food, here's my composition of plant based chocolate chip oatmeal cookies. The beauty of this method is that the substitutions work for most cookie recipes. The most important substitution is egg, replaced by blended flax seed and water. I use the ratio found at King Arthur Flour and blend using this immersion blender. 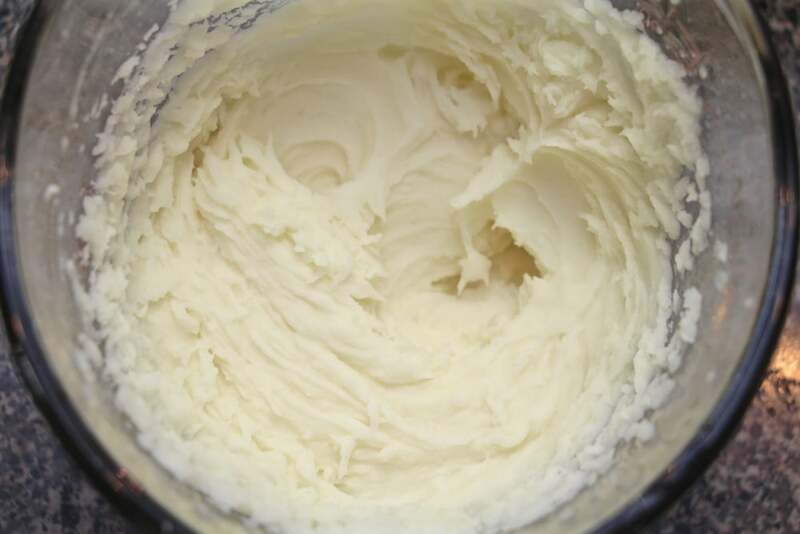 Butter is swapped out easily for refined coconut oil. You know my craziness in the kitchen. Not much for a recipe; I mixed things together until they looked right. In any case, it's important to add the flour after all the sugar and liquid ingredients have been thoroughly incorporated. Otherwise, with a lot of mixing, the gluten in the wheat begins to form, making a tough cookie. The very last step is to stir on the oats and chocolate chips. I used a nice vegan Belgian dark chocolate. It's easiest to portion the cookie dough using a scoop. Onto a silicone baking mat (or parchment paper), flatten the lumps of dough and top with a square of chocolate. 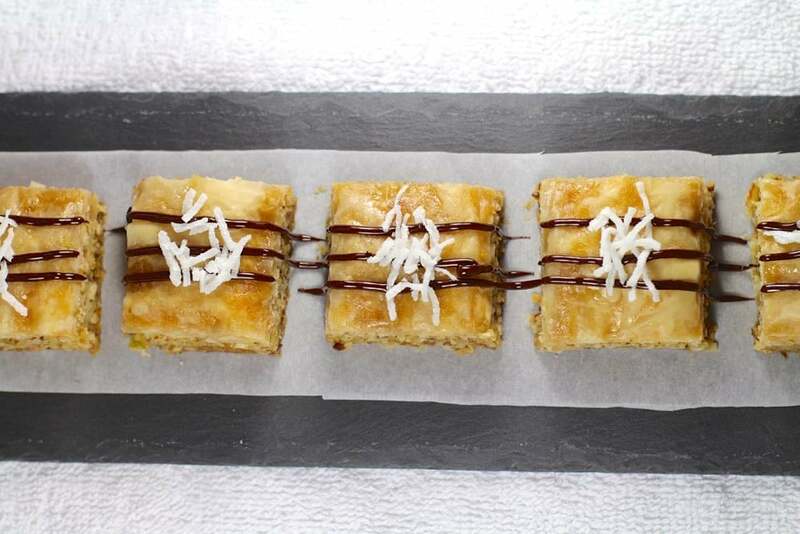 Add another dimension of flavour by garnishing the chocolate squares with a couple crystals of Maldon Salt. Bake at 350˚F until the edges are just browned. This yields a crispy border and a chewy center. Allow the cookies to cool and enjoy! This is a quick and easy dish. It's fresh, it's filling and it's great comfort food. Begin by preparing soba - a buckwheat flat noodle - by following the directions on the packaging. 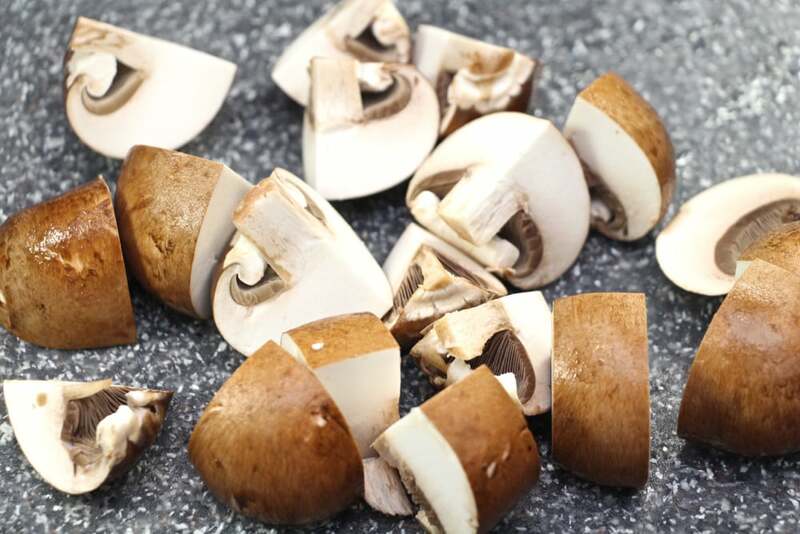 While that's cooking, prepare the bok choy and mushrooms by slicing them and sauteing over high heat with a bit of sesame oil. Add together the cooked noodles, bok choy, sesame, a whisper of grated ginger tamari sauce and mushrooms. Plate the noodles with fresh sliced tomatoes. The whole dish is ready in about 10 minutes. It's a delight. 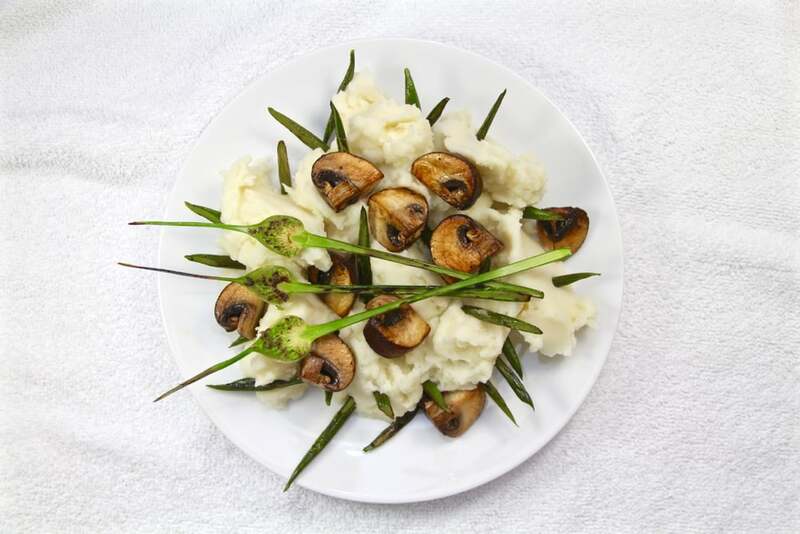 This is a quick and easy dish with a St. Patrick's Day hue. Creamy watercress soup! First, hack up the white bit of 2-3 leeks and one large potato. It's also fine to use the green part of the leek, but it will result in a slightly darker colour. Sautee them with a bit of olive oil until the potatoes are tender. You don't want them to begin to brown since that will result in a darker soup. Then, add to a blander jar: a couple hand-fulls (about a cup of leaves) of watercress, the cooked leek and potato and a hand-full of macadamia nuts. I just used regular roasted macadamias. 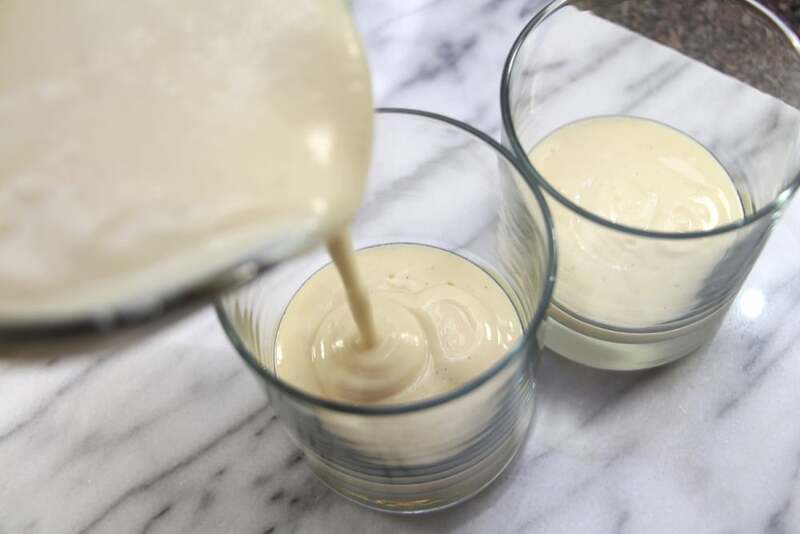 Blend on medium speed and add water until the mixture is thin enough to puree. Next, ultra puree the mixture! It needs to be completely smooth (I used a Vitamix, for the perfect consistency). 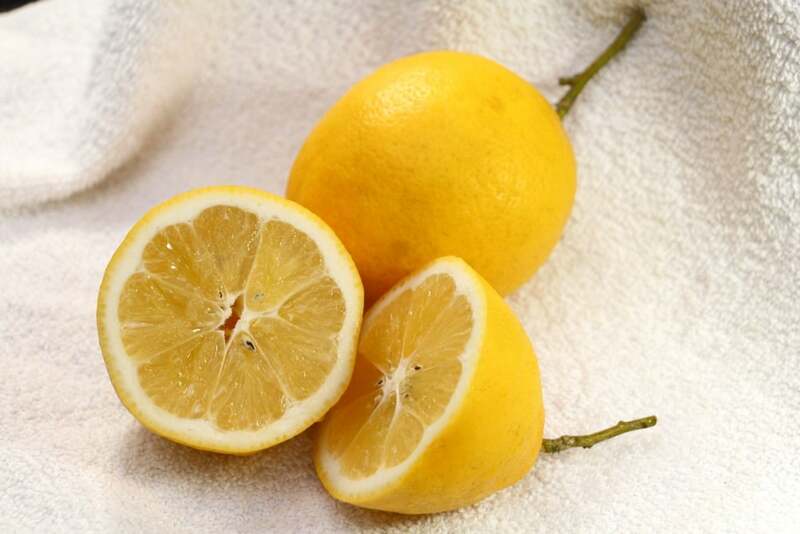 When it's very smooth, taste and season it with salt, and if you like, a little squeeze of lemon. 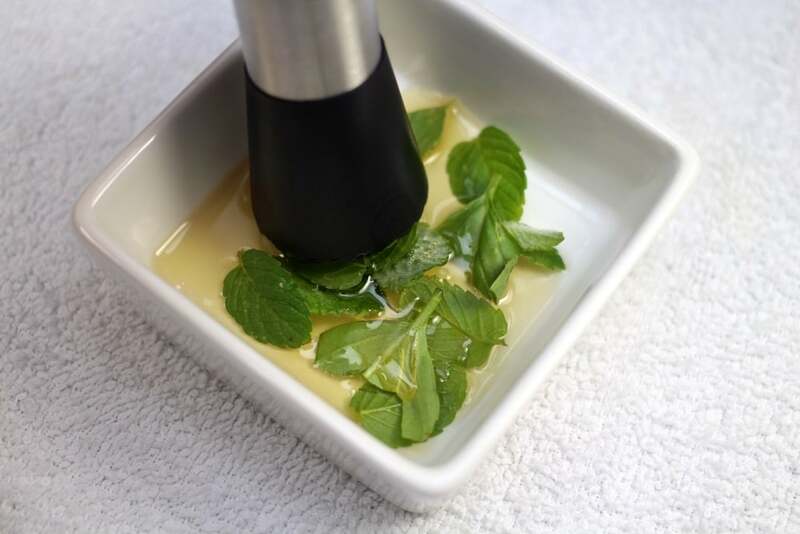 Garnish with a few watercress leaves and a drizzle of macadamia nut oil.